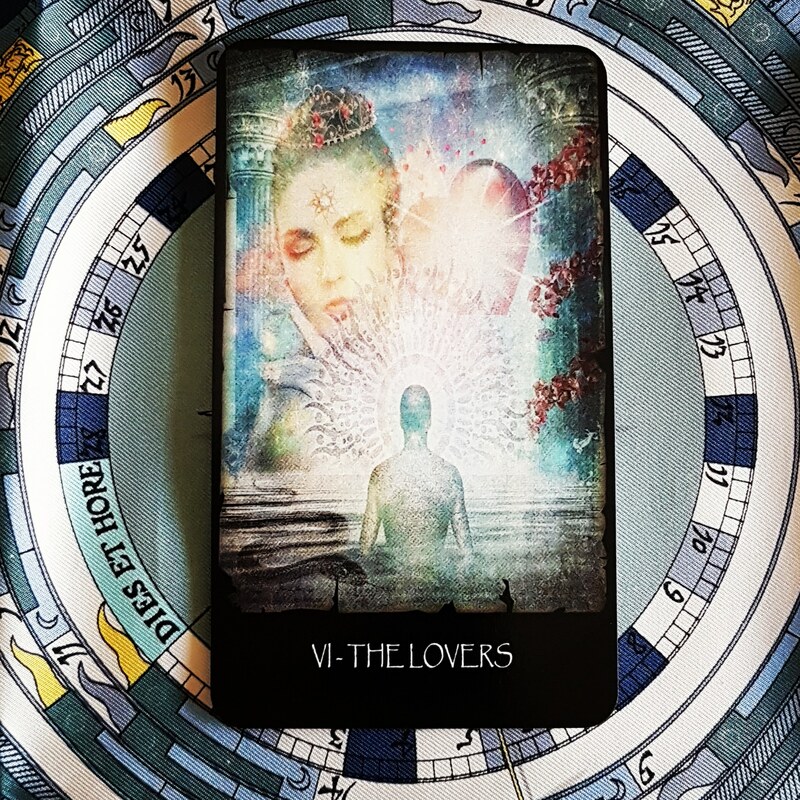 I’m now offering two types of personal tarot readings by email: monthly insight readings and weekly love readings! 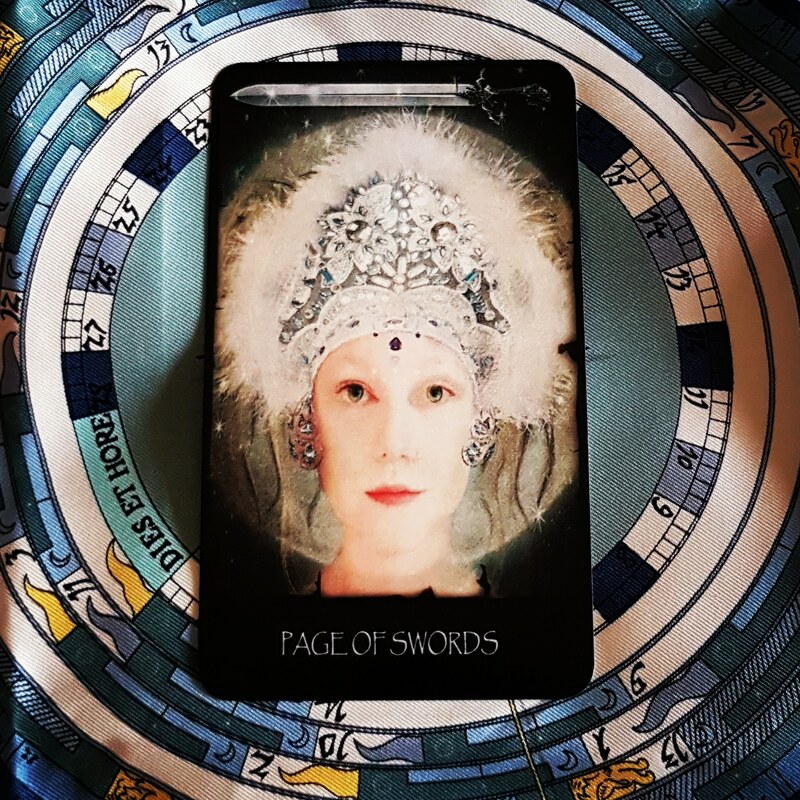 You can also follow me on Facebook and Instagram for daily tarot guidance and interactive fun. 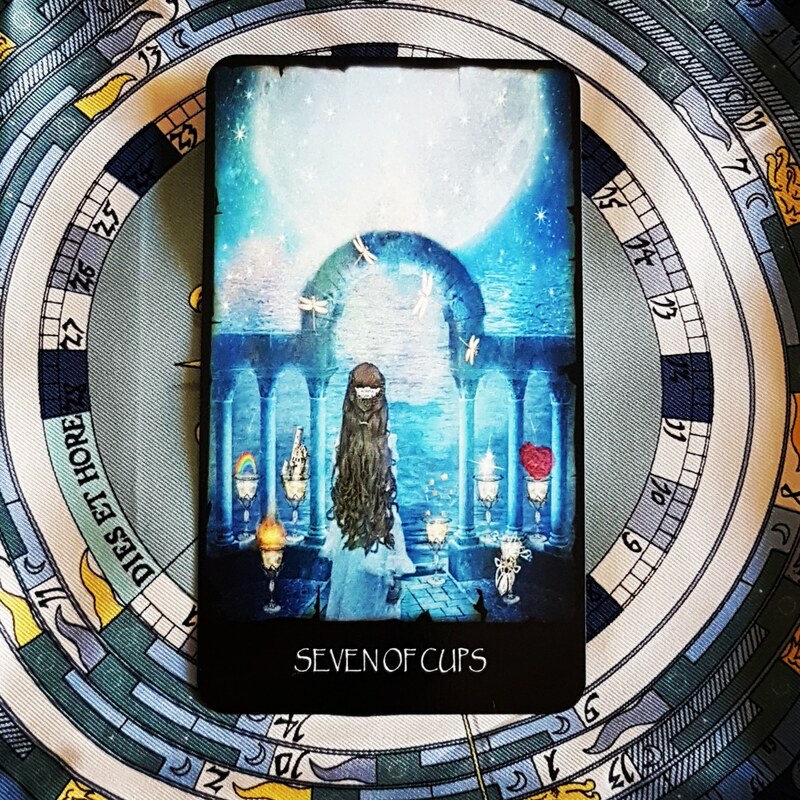 The 7 of Cups represents having too many choices, all of which seem very appealing to you. You are spending time dreaming about them, imagining what each would be like. Still, you cannot pick one. This card includes a hint that might help. You are drawn to these choices emotionally. Set aside those emotions for a moment and invite a little reason into the picture. While emotionally appealing, some of the choices may not be good for you. Choose wisely. 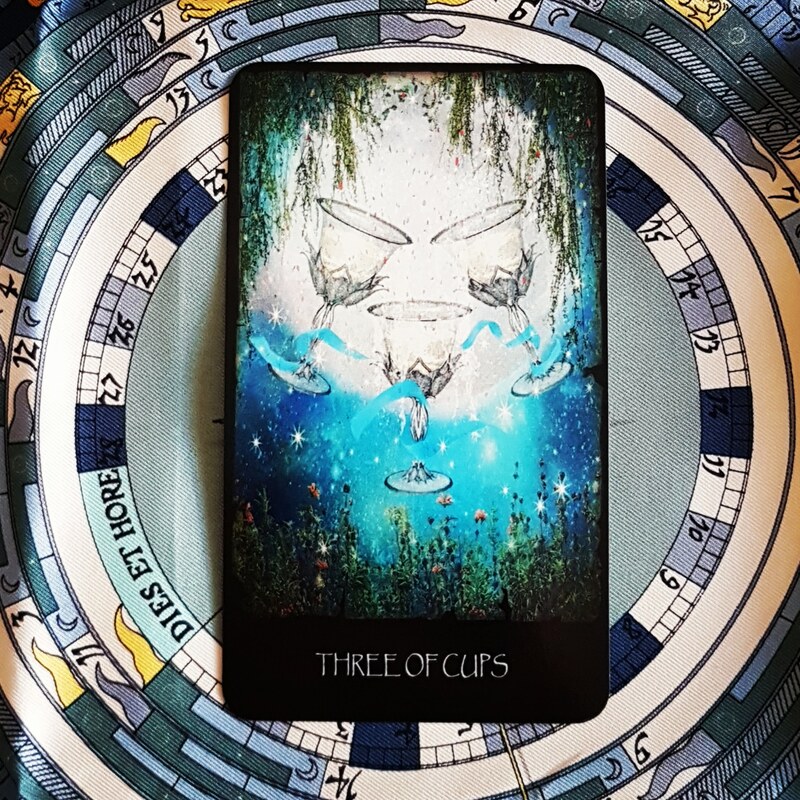 The 5 of Cups shows a time of difficulty and loss. More specifically, it is about how you deal with loss. Every loss initiates change and is an opportunity for growth. Loss hurts because of our emotional resistance to change. This card represents that moment. But it carries a word of advice: look at the wonderful opportunity around you and move forward. 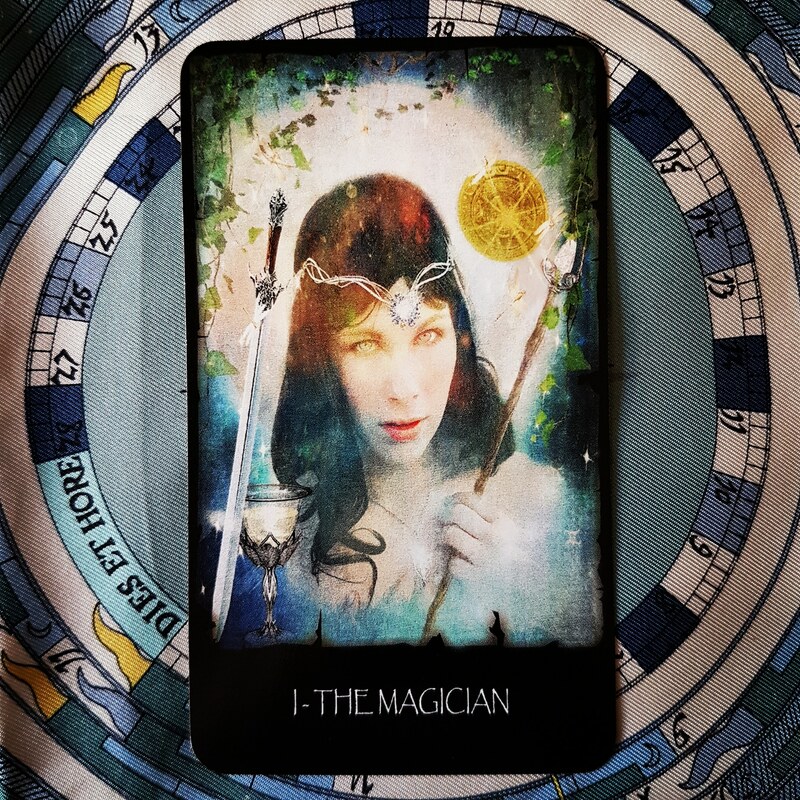 The Magician indicates that it is time to focus on your goals, applying your determination and skill to achieve those goals. Everything you need is available and you have the ability necessary. 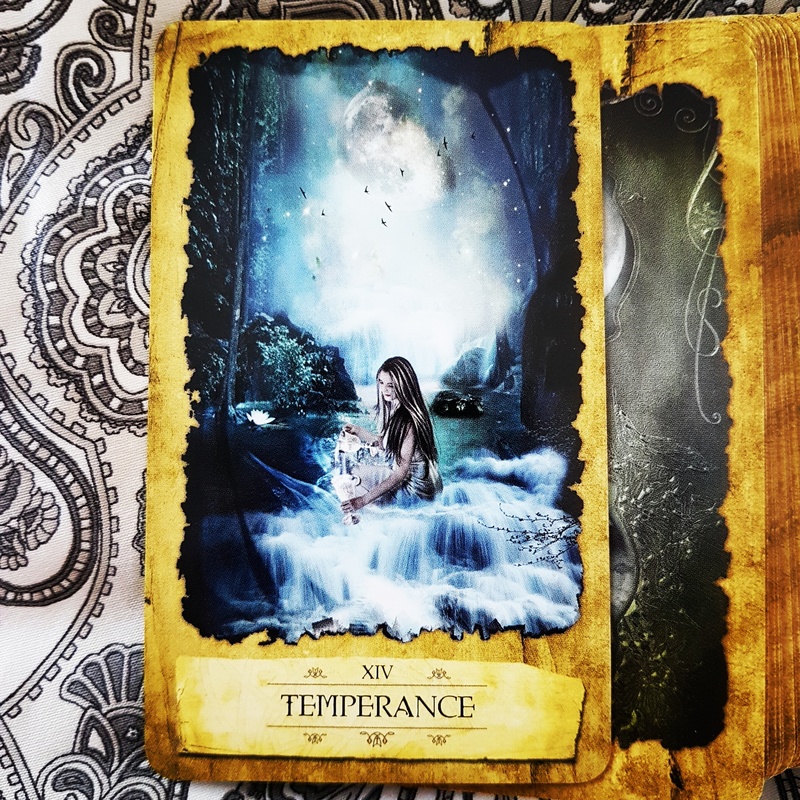 Move forward with confidence because this card suggests success in your endeavours. This is a magical moment filled with potential just waiting to be realised. 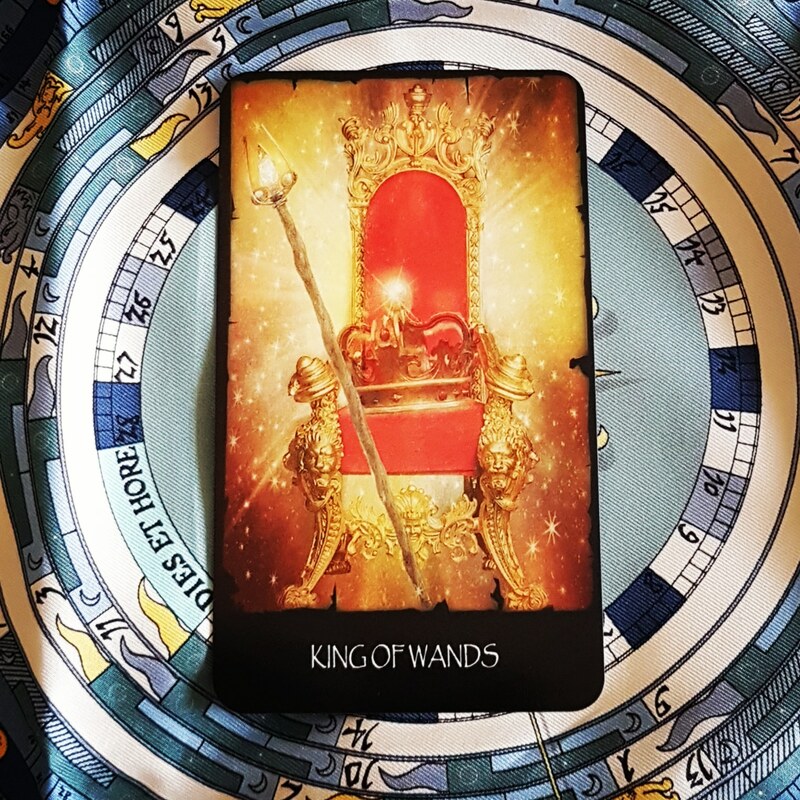 The King of Wands is passionate and leads with confidence and energy. He is not one to go with the flow. He sets his own goals and makes his own way towards them. You have the wisdom, experience and energy to succeed at whatever it is you want to achieve now. Trust in yourself. Be bold and fearless. Make a grand gesture this month! 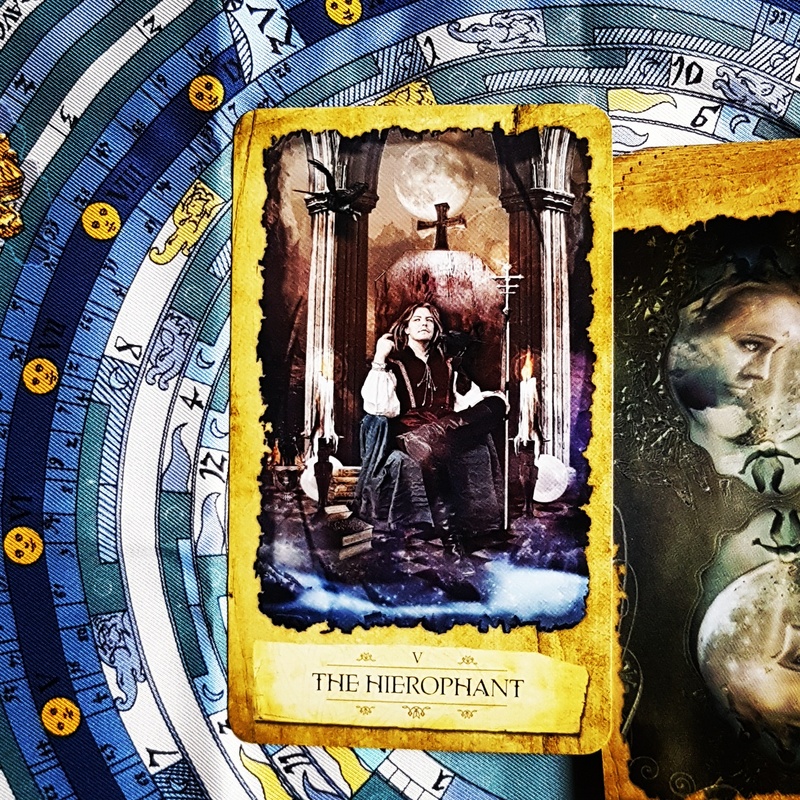 The Guide (The Hierophant in most traditional decks) often represents learning with experts or knowledgeable teachers. This card also stands for institutions and their values. It is a symbol of the need to conform to rules or fixed situations. 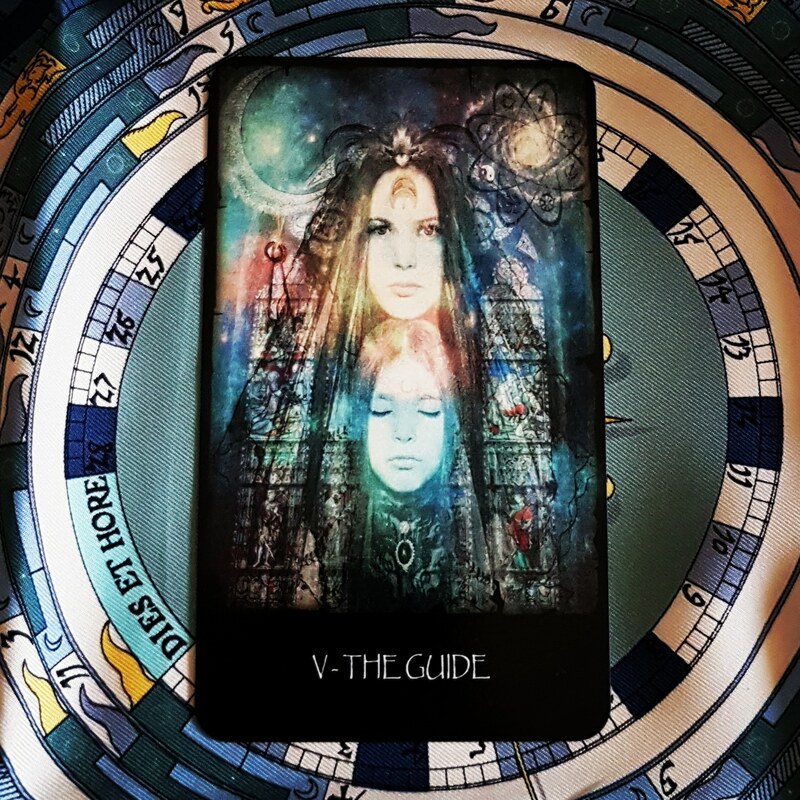 The Guide card can show that you are struggling with a force that is not innovative, free-spirited or individual. Groups can be enriching or stifling, depending on circumstances. Sometimes we need to follow a programme or embrace tradition; at other times, we need to trust ourselves. Listen to what people have to say, but keep an open mind and take only what resonates with you. 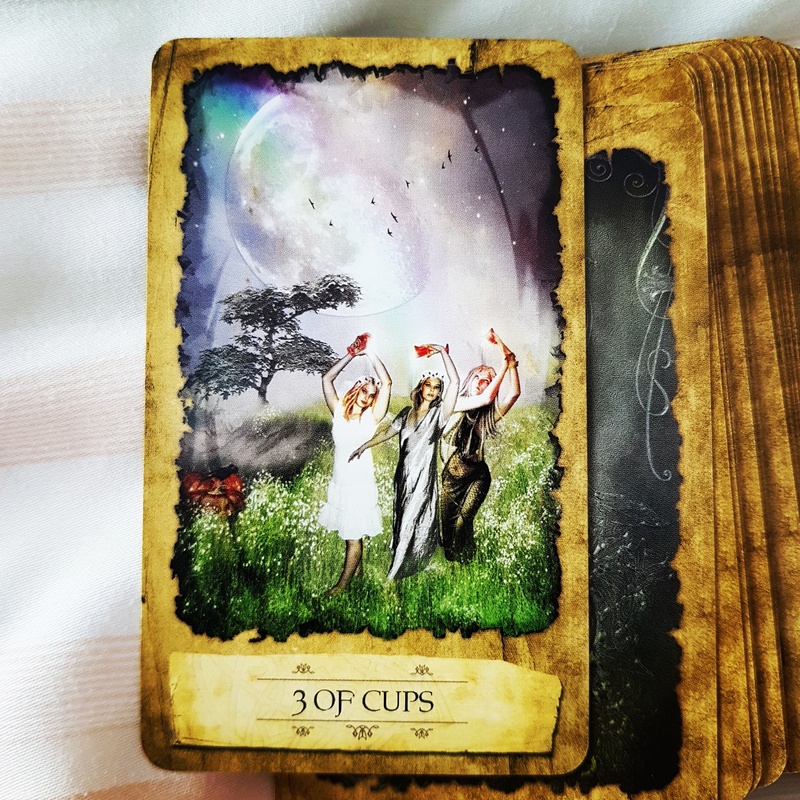 The 3 of Cups represents a time of celebration and mutual support. It is the grateful recognition of family, friends and community and all that they add to our lives, often in the form of holidays, birthdays, anniversaries or other celebrations. 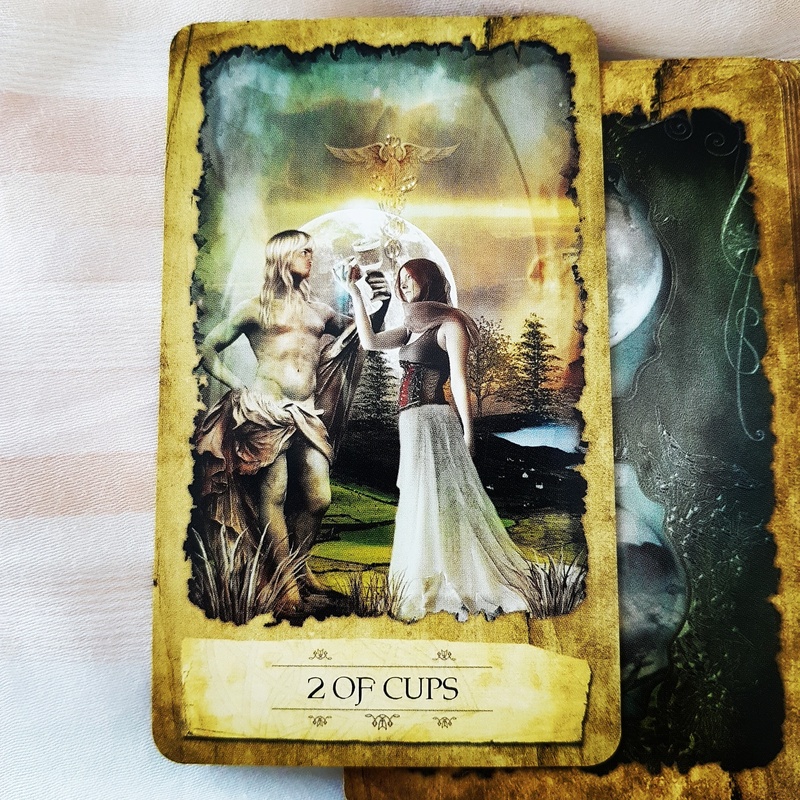 The 3 of Cups can suggest the end of disagreements by way of a happy compromise. It is an all-round good omen in financial, relationship, work or spiritual concerns. Learn how to appreciate your friends. 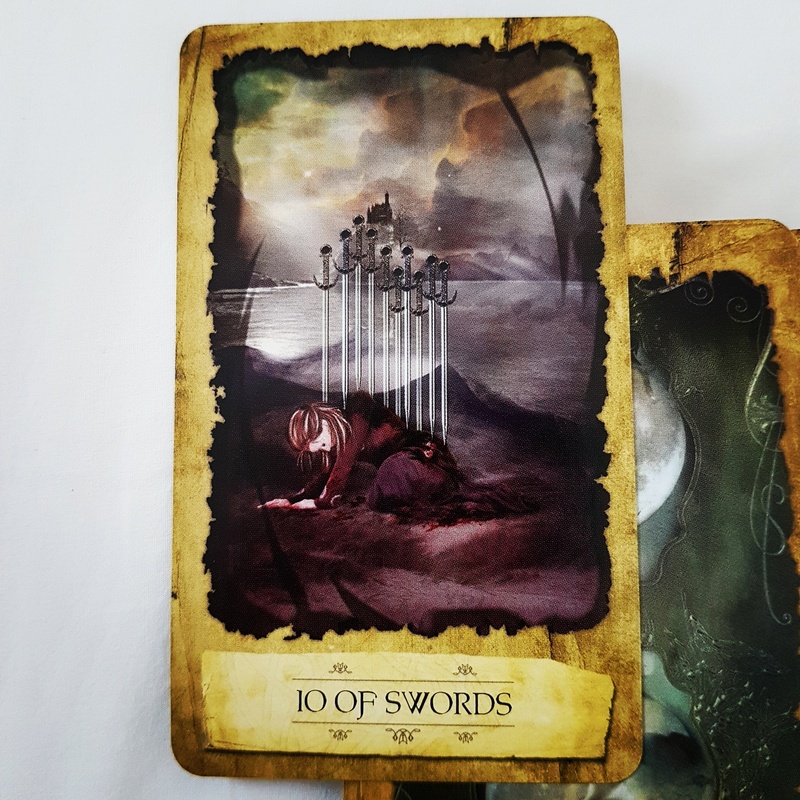 The 8 of Swords represents a situation in which you feel helpless. Problems surround you. You feel trapped and that no matter where you look, danger, obstacles and problems confront you. 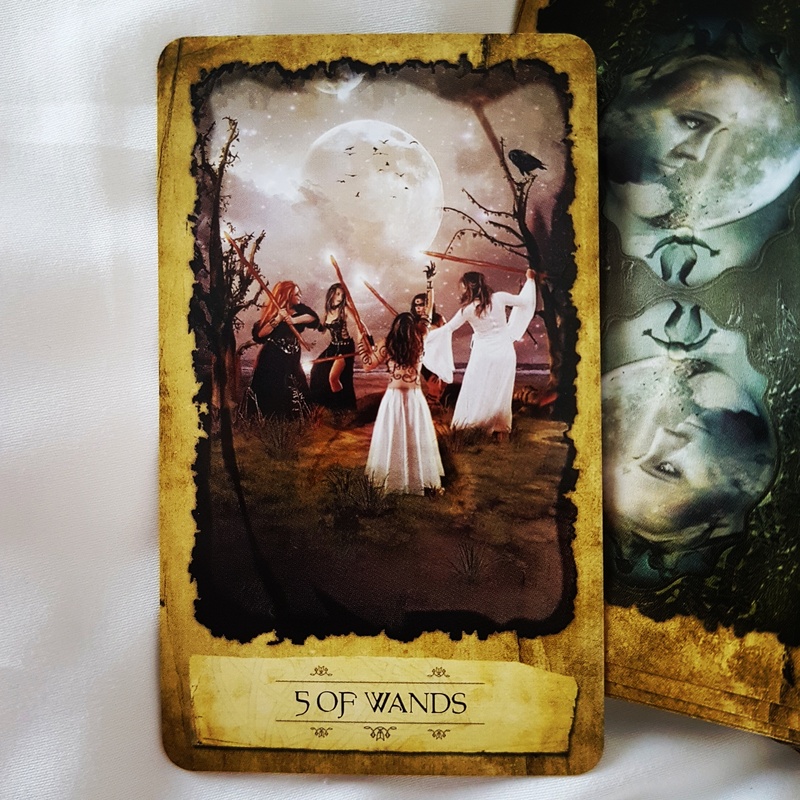 When you see this card, remember that you do have choices and you do have power. No matter how trapped you feel, you can find a way out if you believe it is possible. Solutions are not always easy, but they exist. Find your clarity of thought and purpose and use them to take the first step home. 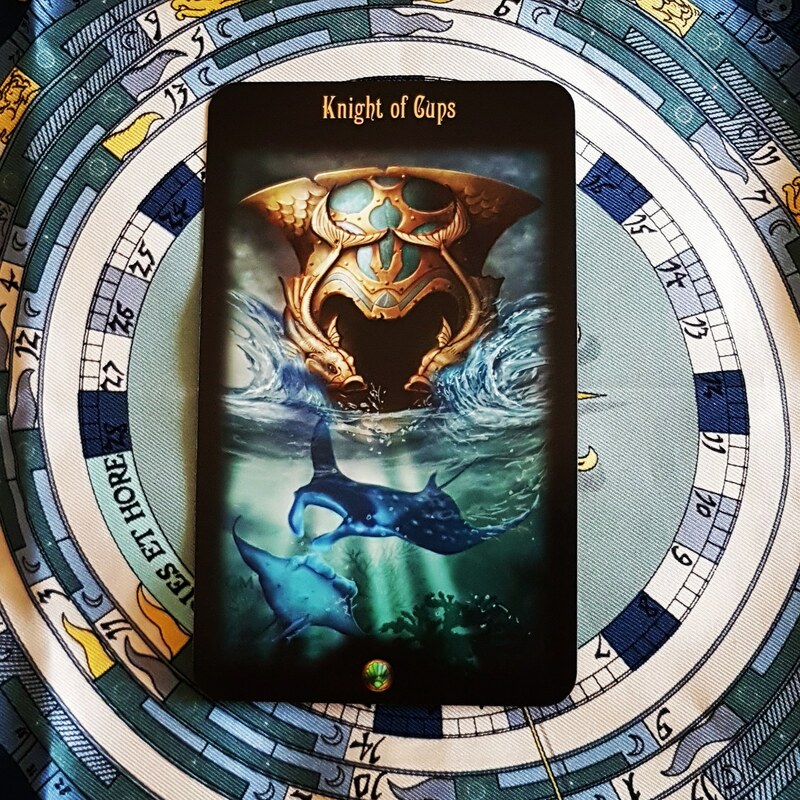 The Knight of Cups’ sensitive style is involved in a situation as an aspect of you, someone else or the atmosphere in general. Follow your heart and see where it takes you. Instead of dreaming, get up and do what your heart desires. Do you express yourself fully to people around you, even the ones that you are close to? If not, what holds you back? Tell someone how you really feel this month. 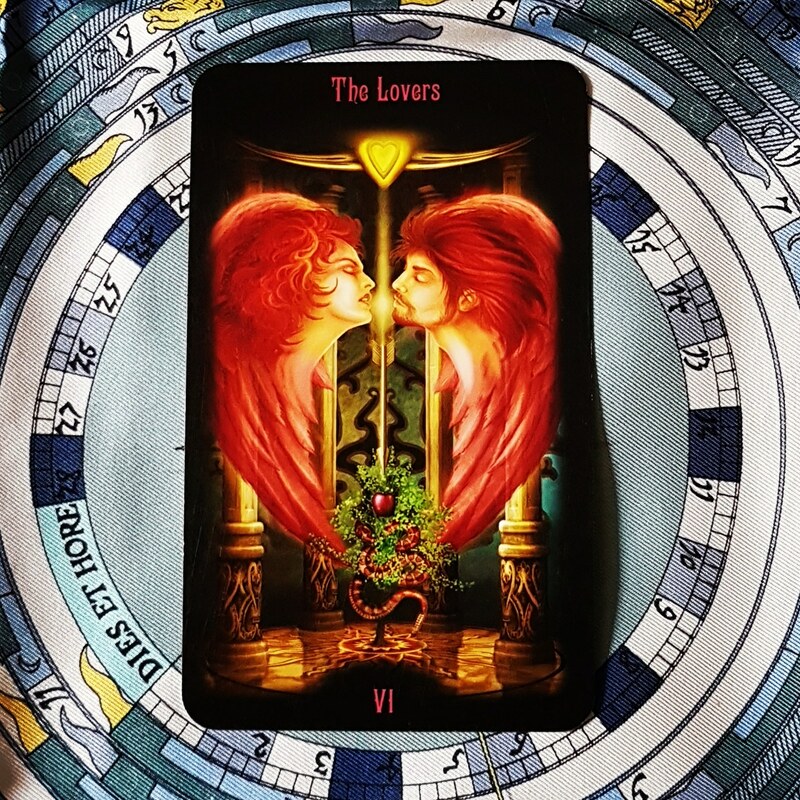 The Lovers represents a choice to be made. More importantly, it represents different ways to make decisions. 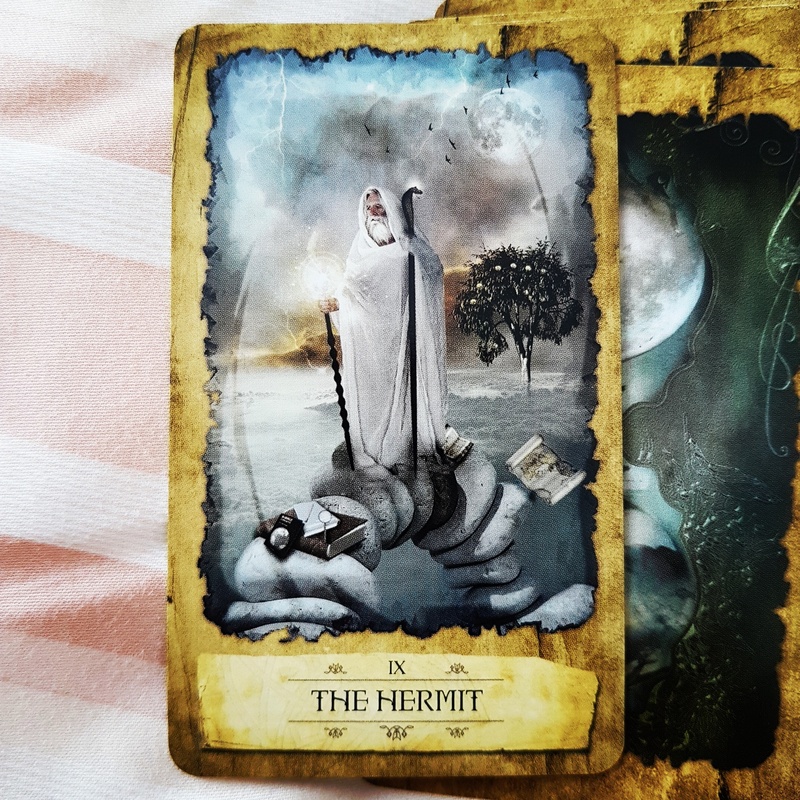 When this card comes up, you are being asked to consider carefully how you make the important decision before you. Do you follow your heart? Do you do what makes sense? This card suggests that there’s a way to marry the head and heart so that wise, balanced decisions can be made. Weigh up the consequences of each of the choices before making your decision. 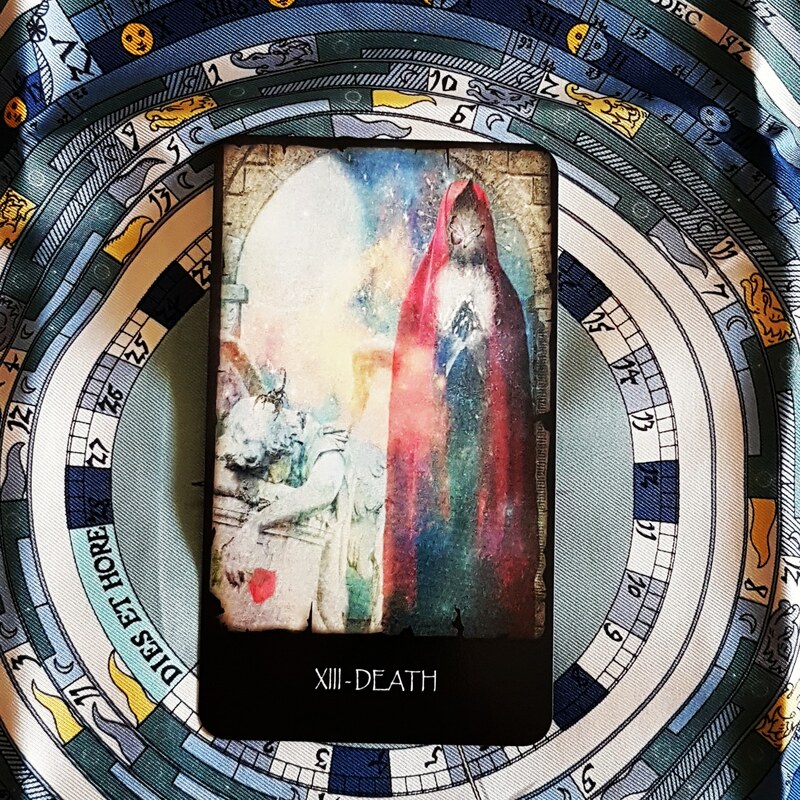 The Death card rarely refers to physical death, which is some comfort. Death, whether physical or metaphorical, is not an easy experience. This card implies the end of something, perhaps a job, a relationship, a situation, an organisation. The actual ending will likely be hard, but once it’s over the cycle continues and something new will come. On the other hand, it may be a welcome closure, such as ending a bad relationship, quitting an unhappy job or selling a house to get a new one. 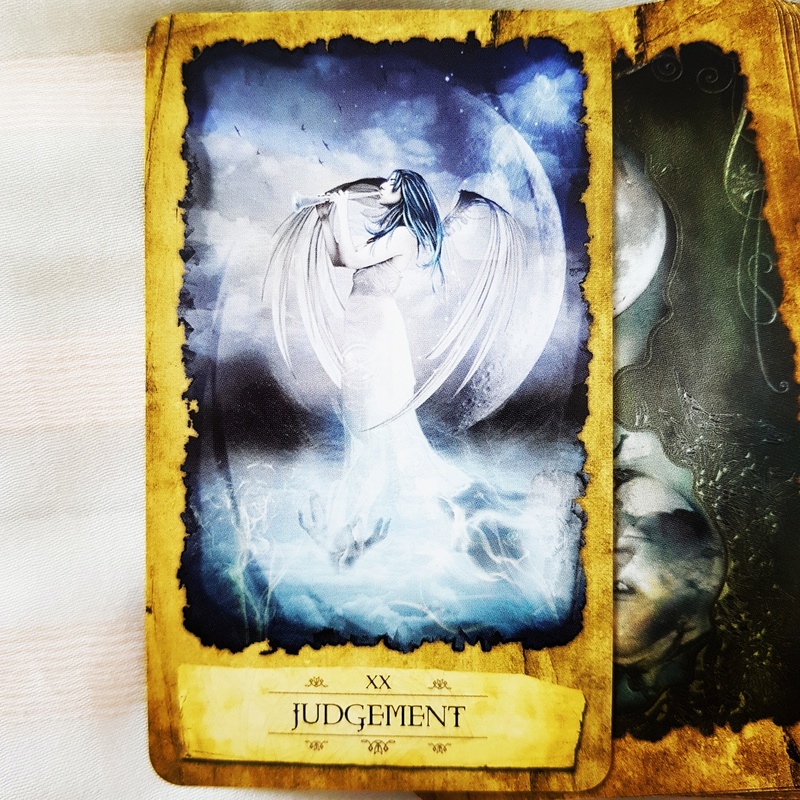 On a spiritual level, this can mean a symbolic death where you eliminate old beliefs that no longer work for you and perhaps were holding you back. Death is usually hard, but it must happen before transformation or resurrection occurs. 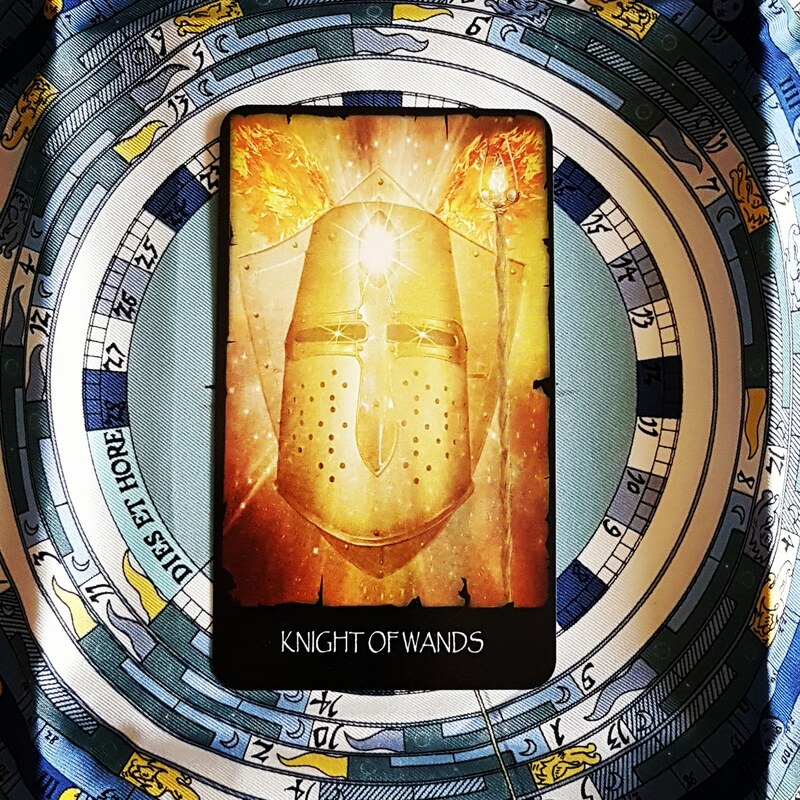 The Knight of Wands is impetuous, impatient, generous and ambitious. He is willing to go anywhere and do anything and is happiest when he has a clear goal. He is probably very popular and the type of person people like to be around. On the other hand, he can be unreliable. Because he is impatient and impetuous, he can lose interest in the task at hand and run after the next shiny new challenge. Use this Knight’s energy to your advantage. If you’re in a rut, try something new. If you get bogged down by details, try winging it for a change. Again, on the other hand, if you’re angry and impatient all the time, or cocky rather than confident, it may be time for a change. The World is about big achievements. It promises the wonderful conclusion of long-term projects and the realisation of goals. Success, completeness, satisfaction and fulfilment are woven into your life. It’s time to fully close the door on the past and move to the next stage of your life. This card can also indicate major trips and extensive travel. 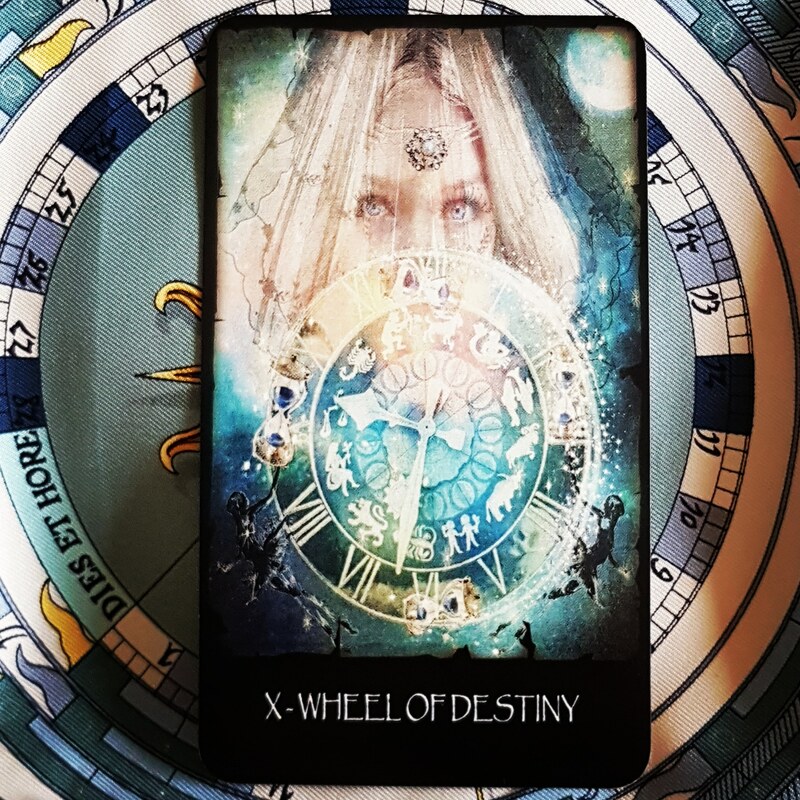 The Wheel of Destiny represents an unexpected change in your plans, a conflict of interest or an idea ready to materialise. Whatever happens will be beyond your control. This card advises you to get ready for something new. Don’t be rigid with your plans at this time, but prepare to go with the flow. Take any events that occur in your stride, whether they are positive or negative. If things are good, enjoy! If things aren’t so good, know that it will not be forever. The Knight of Swords is a master of logic and reason. He has a keen intellect that grasps the fine points of any subject. He speaks clearly, directly and always with authority. His judgements are sure and free of emotion. On the other hand, this Knight is not a master of diplomacy. He can be downright tactless and rude. When he thinks you’re wrong, you’ll know it. To him, feelings are irrelevant and illogical. 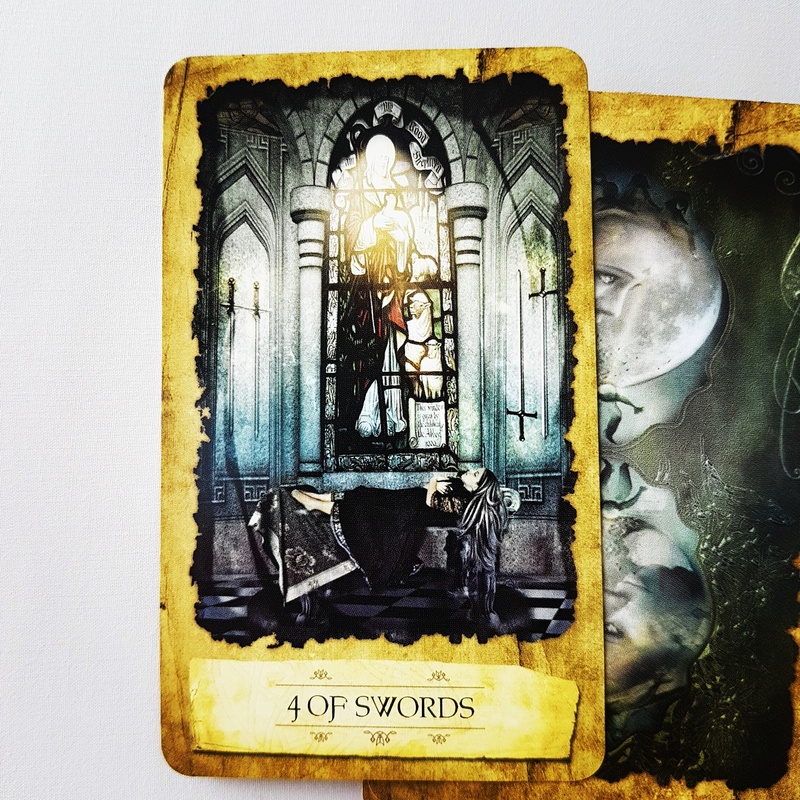 This week, ask yourself whether this Knight’s energy is helping or hurting you. Are you too emotional? Let your head rule your heart. Are you afraid to offend? Speak your mind. Try to find a happy medium between his two extremes. 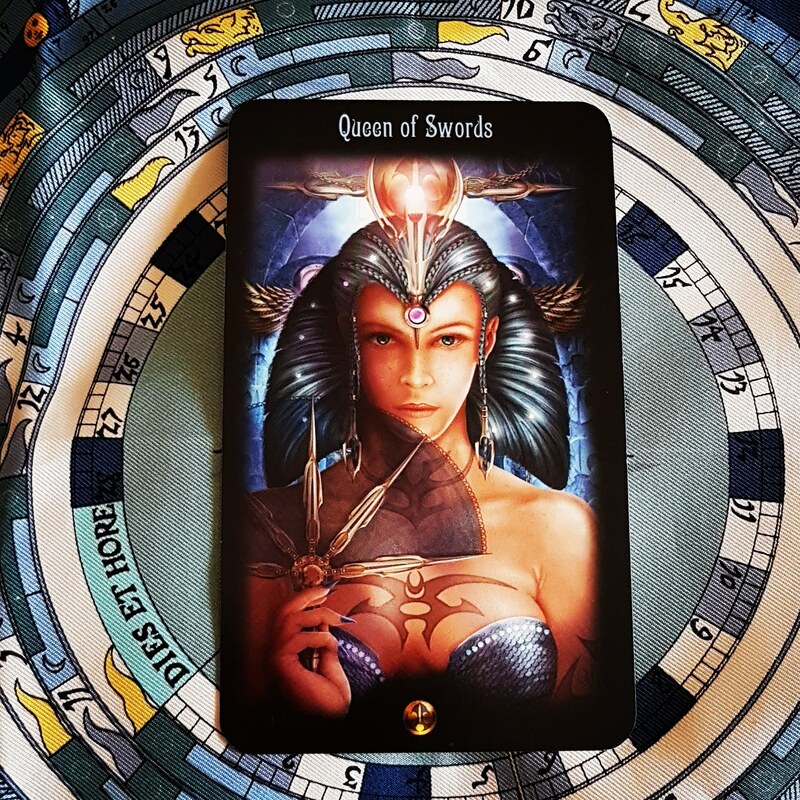 The Queen of Swords will always tell you exactly how it is. Above all else she admires honesty, and she lives by her commitment to being truthful. She is experienced in the ways of the world, good and bad. She prefers being straightforward and direct. Her observations are candid, but never hurtful. In fact, this Queen has a delightful sense of humour. She likes a good laugh and always has a witty comeback ready. This week, think and feel as this Queen does. For example: Are you being completely honest? Do you see the humour in the situation? Are you getting right to the point? Have you figured out what’s really going on? Say no to the things you really don’t want to do but usually end up doing to please others. 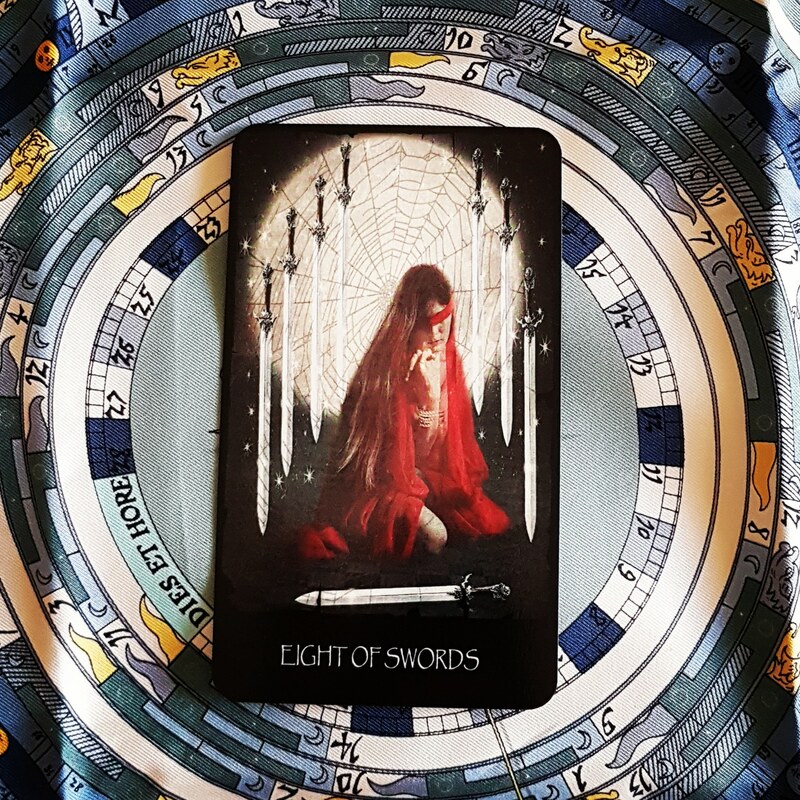 The Page of Swords represents someone who is curious and wants to know everything. This card suggests you open up your thinking. It is an ideal card for problem-solving and thinking out of the box. Look out for messages about problems, solutions and perhaps some gossip. Be patient and don’t rush into anything. Listen to what people have to say with a rational head – don’t take things too personally. 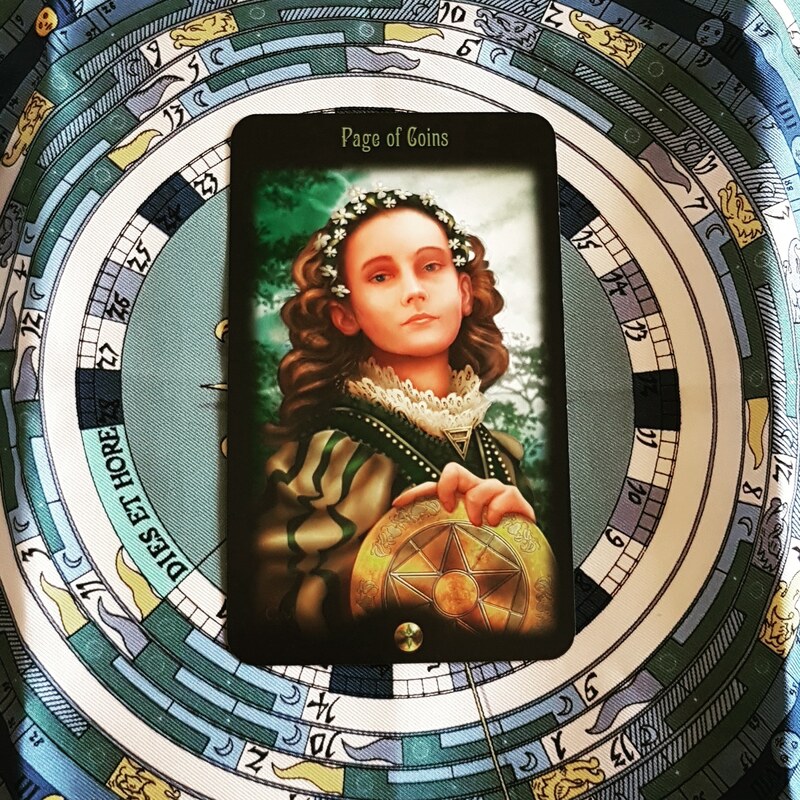 The Page of Pentacles is industrious, crafty and earnest about saving money. This Page likes to learn new things and enjoys structured learning, classes, workshops and programs – look out for events that interest you this week. You can be clever and creative in finding little ways to earn extra income. Look out for messages about money, resources, material matters and health issues. Say yes to any opportunities that come your way this month. 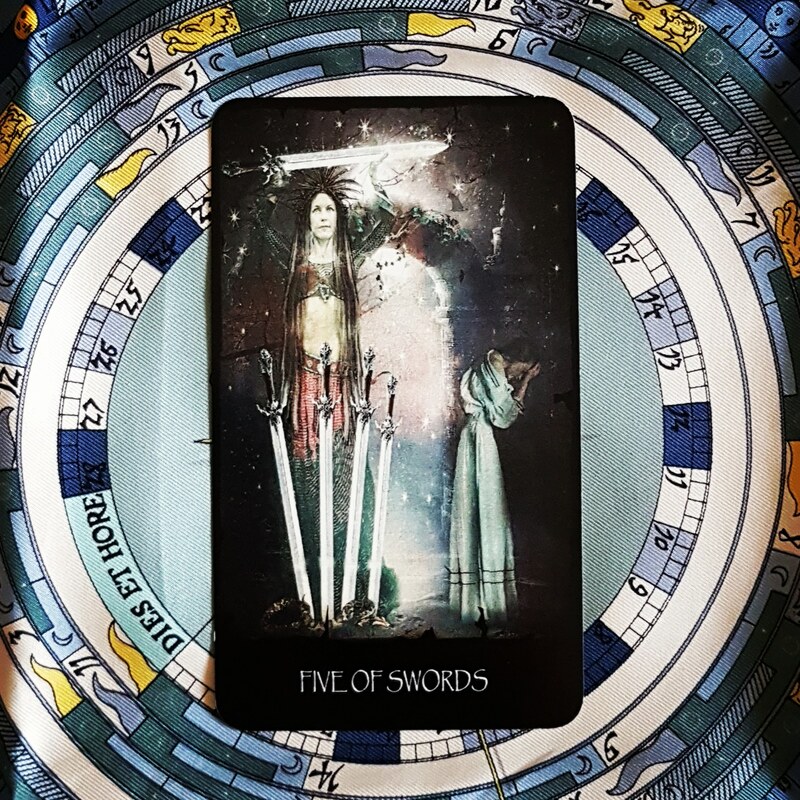 The 5 of Swords represents the end of an argument or clash of some sort. The winner is ambitious and may have won by aggressive or less than honourable methods. It indicates a situation where someone has put her needs above the needs of others and is concerned only for his or her own interests. You will know if you are the winner or the one running away. Either way, hold to a larger view of who you are. Find the solution that is best for everyone… including yourself. This week, apologise to someone you have wronged – don’t let your pride stop you from saying sorry. 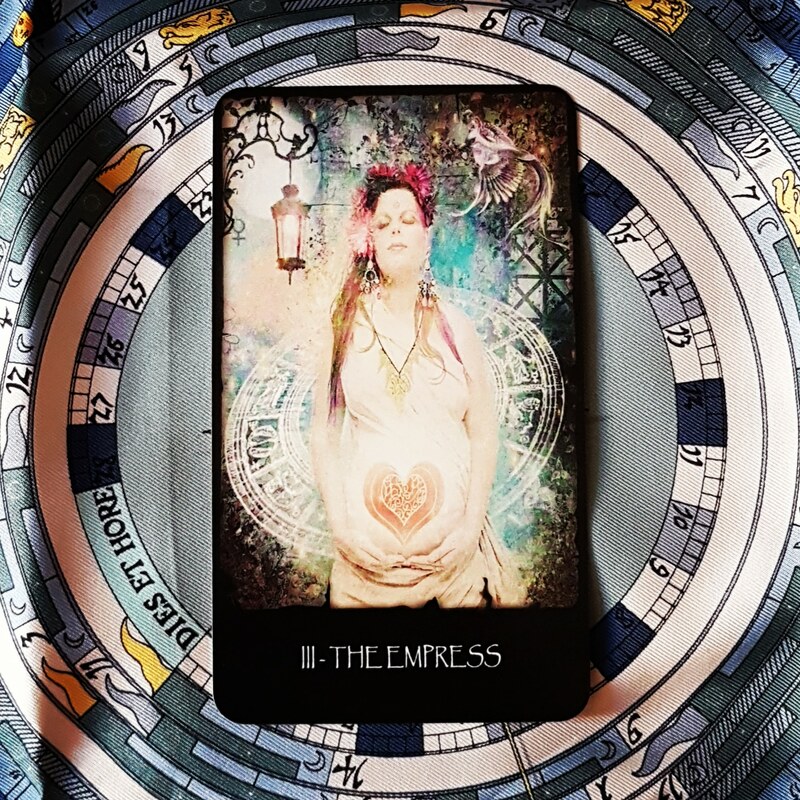 The Empress shows a time of natural growth. Your role is to nurture without forcing or neglecting your project. Pay attention to where you are in the cycle of your project or situation and take the proper steps. There is great potential for abundance if good care is given. This may require action on your part or it may require a time of waiting. 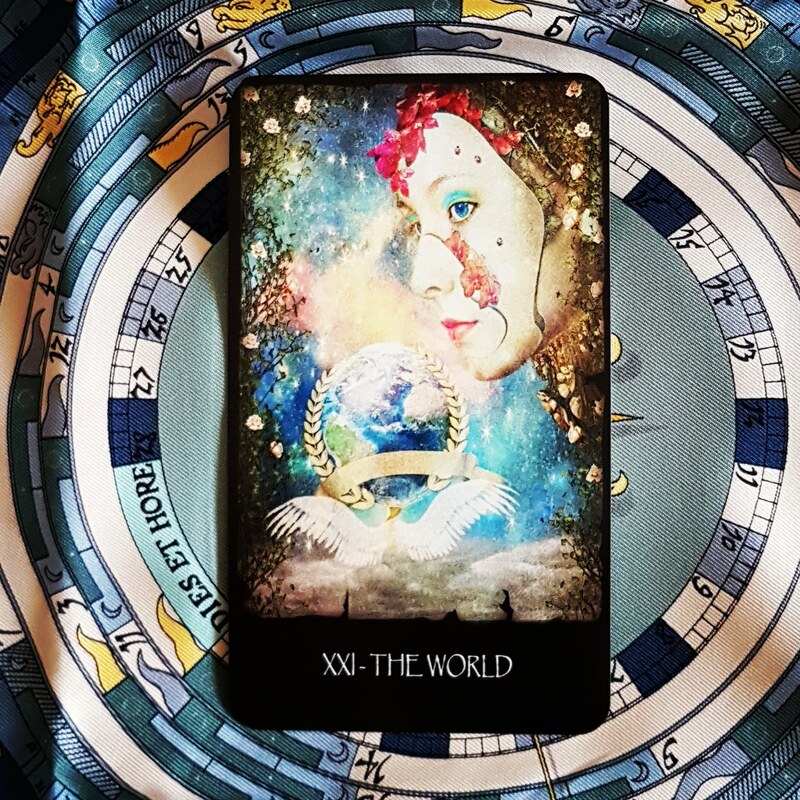 The Empress encourages you to strengthen your connections with the natural world – keep your feet planted firmly in the Earth. She offers an array of delights – food, pleasure, beauty. She also suggests material reward but only with the understanding that riches go with a generous and open spirit. 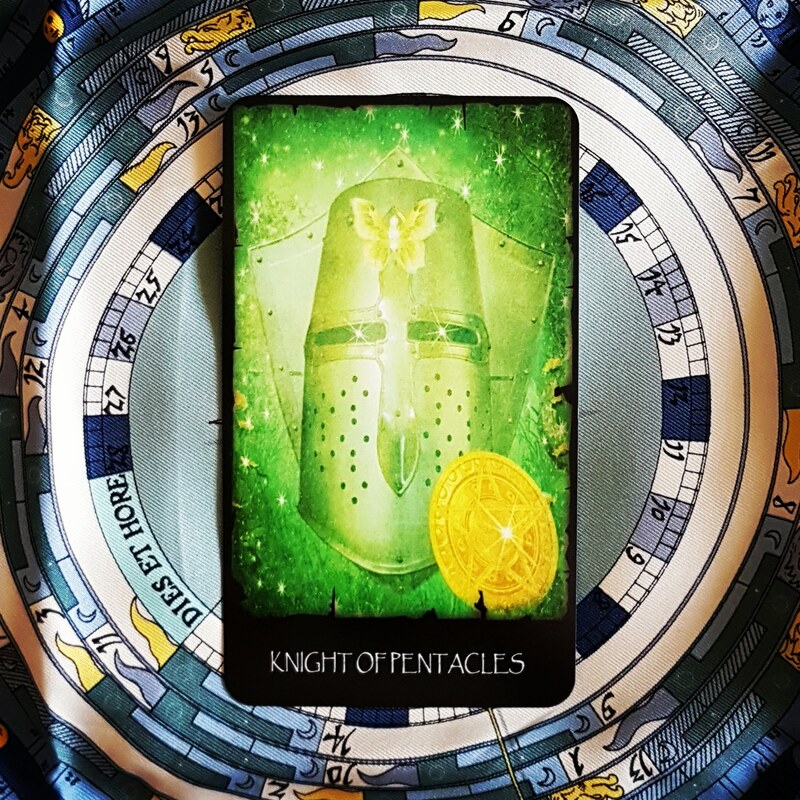 The Knight of Pentacles is like a bulldog – once he bites down, he won’t let go. He’s dogged in pursuit of his goals. He’s a hard worker, has tremendous stamina and is dedicated. Every job is completed down to the last detail. On the other hand, this Knight can be stodgy and dull. He’s not known for his playful sense of humour. Work always comes first and he can be inflexible and obsessive about little details. He refuses to give in, even when he’s wrong (which he’ll never admit). 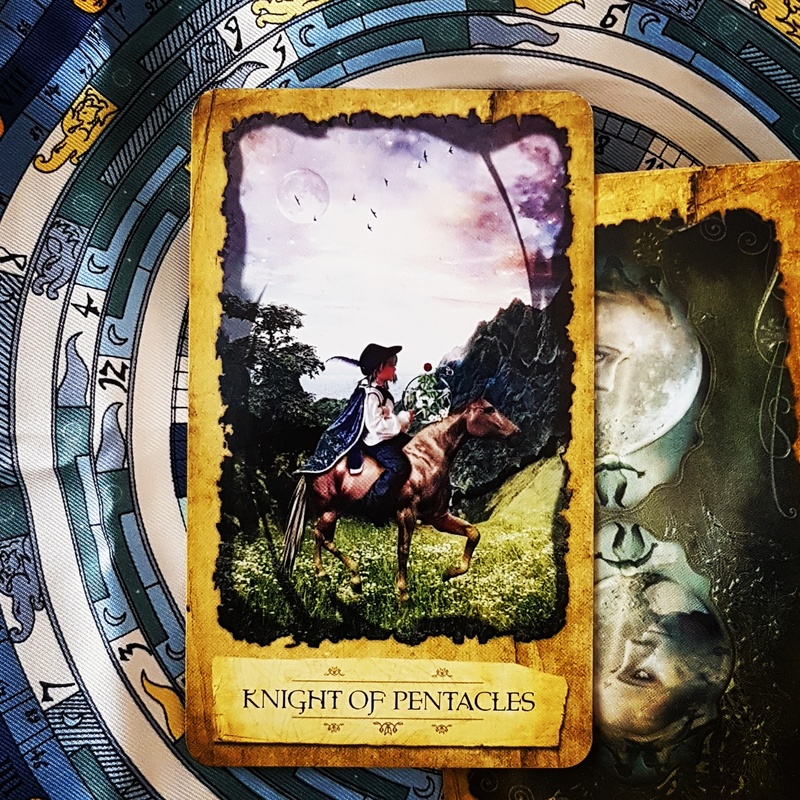 This week, ask yourself whether this Knight’s energy is helping or hurting you – try to find a happy medium between his two extremes. 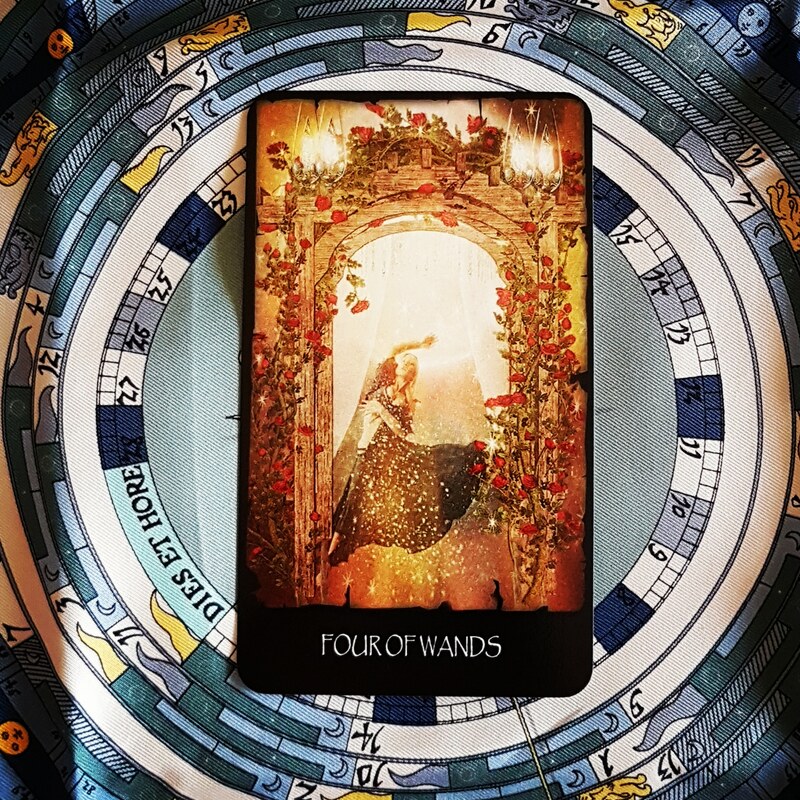 The 4 of Wands represents a moment of celebration. Whatever you’ve been working on is showing good signs of success, so take a moment to revel in it. In fact, things are looking so well, you can use some of your gains to lay a foundation for the future, whether it’s building a house, expanding your business, investing or even getting married. Gather friends and family just to have a night out and celebrate life! 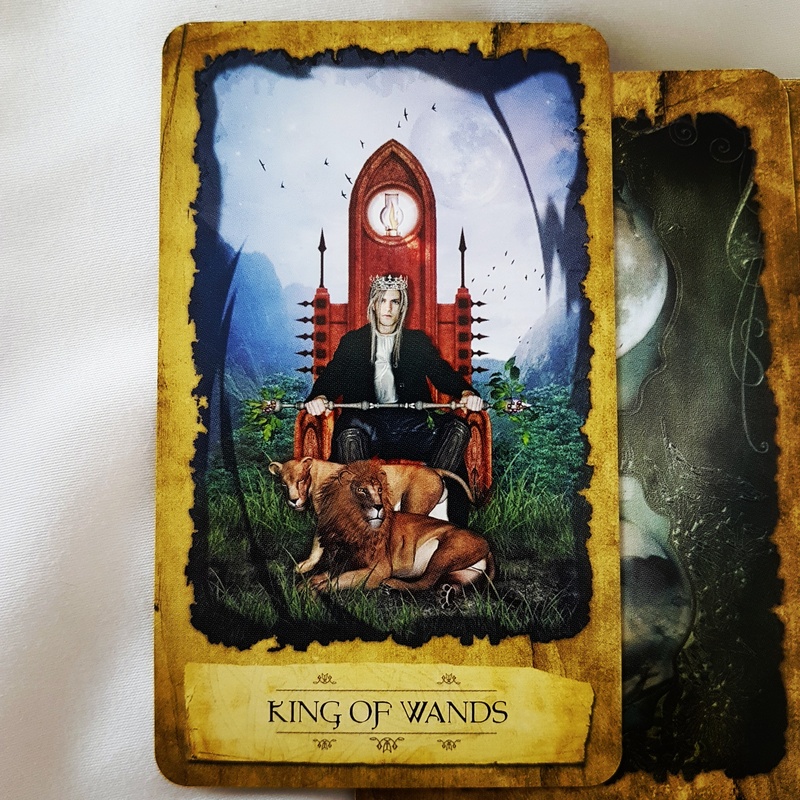 I’m now offering personal tarot readings by email. Please click here for more details. 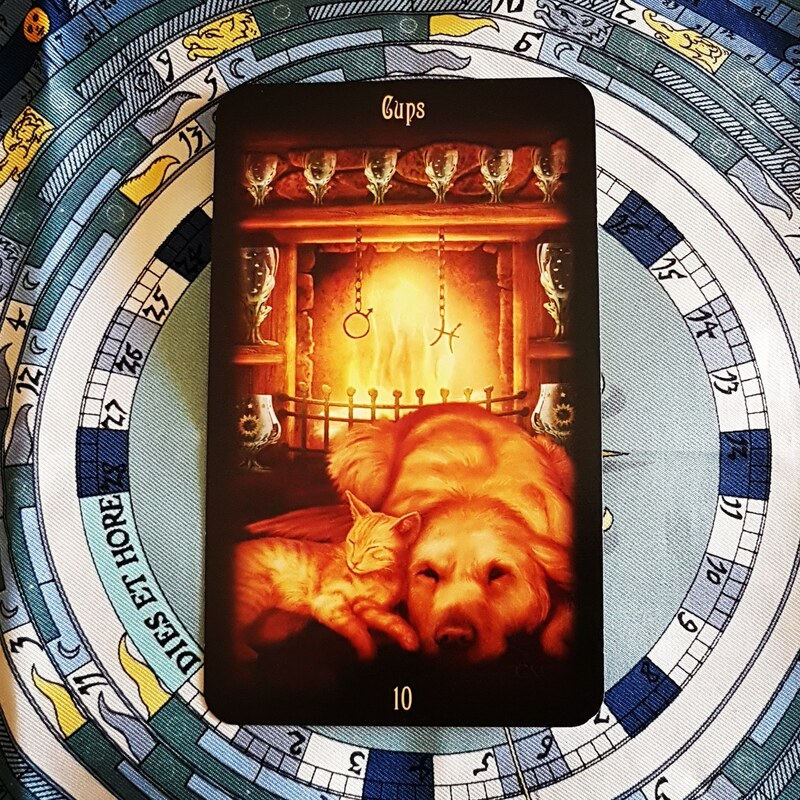 You can also follow me on Facebook and Instagram for daily tarot guidance. Hello from Bombay! Have a great week! 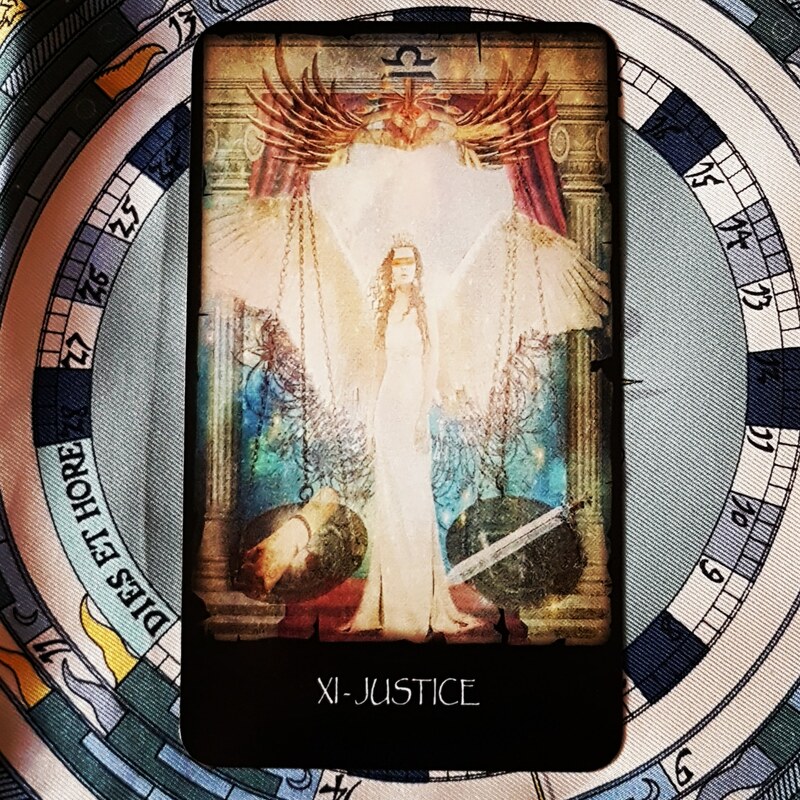 Justice represents the importance of your choices. Whatever decision or decisions you make now will have significant consequences in your future, so choose carefully. Rely on logic and reason to make the decision, rather than emotion. 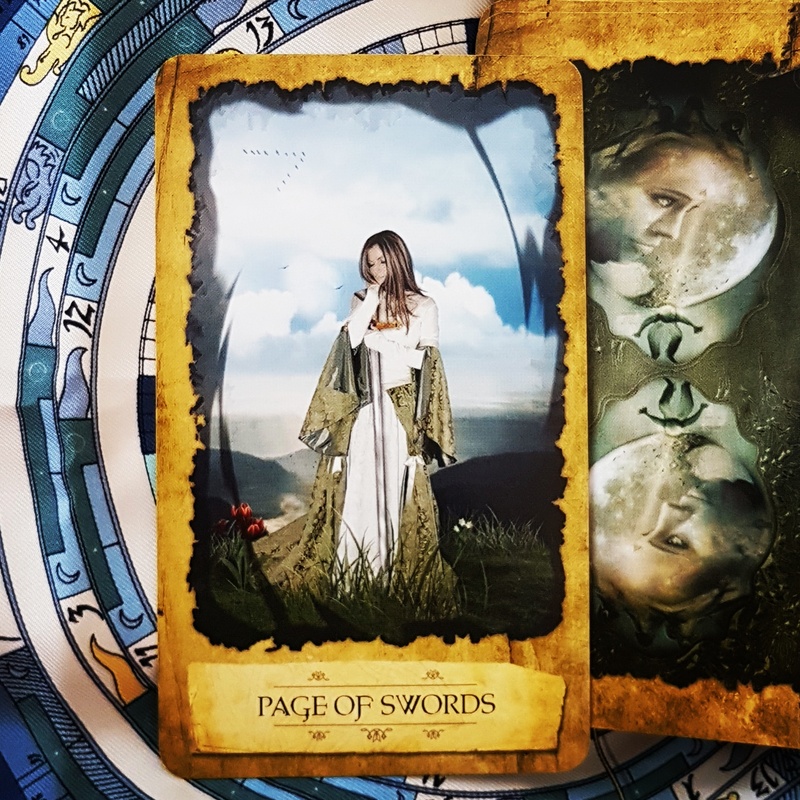 If you are experiencing good fortune, this card can be letting you know that your past actions made the good fortune possible. It could represent a legal situation that will be resolved in your favour. 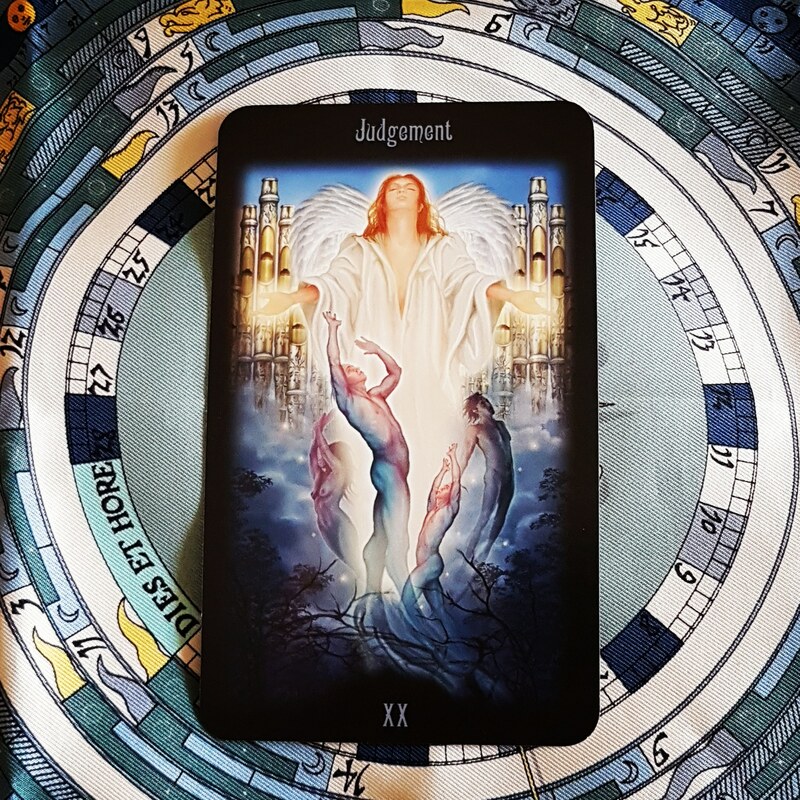 This card is also a reminder to balance your physical concerns with spiritual growth. 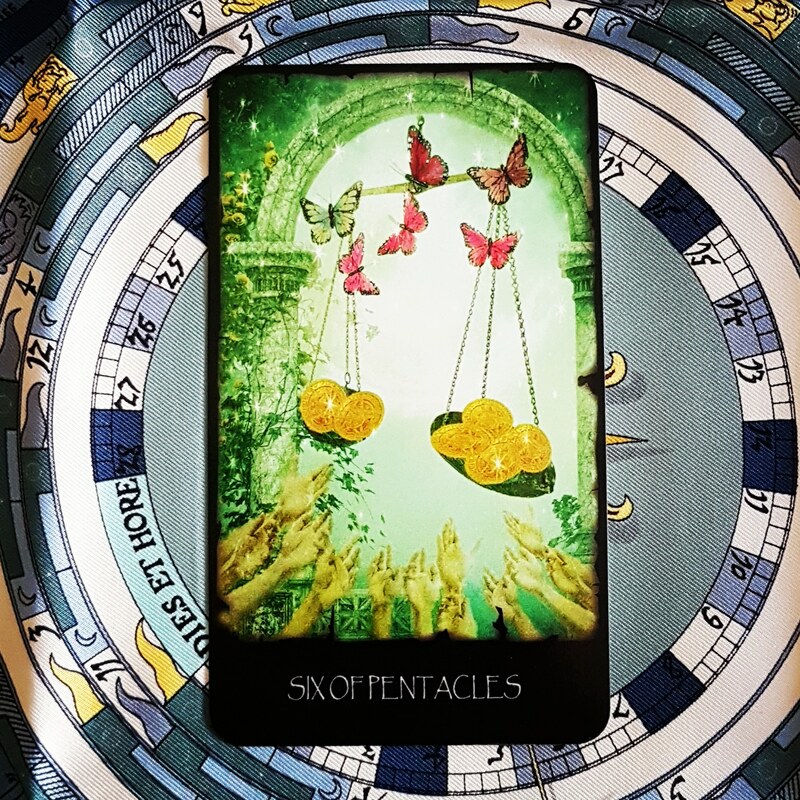 The 6 of Pentacles deals with giving and receiving. Depending on your situation, this card can have different meanings. If you have a need, that need will be met by a gift, donation or through some unexpected source. 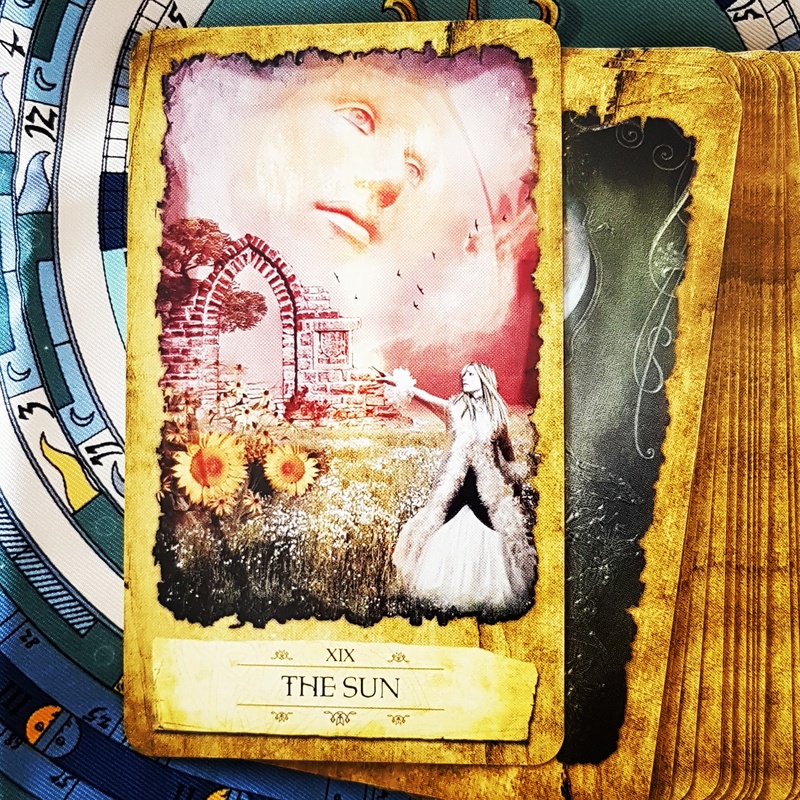 If you are seeking aid, such as a scholarship or loan, this card is a favourable omen. If someone approaches you for help, you will find yourself in a position to provide it. 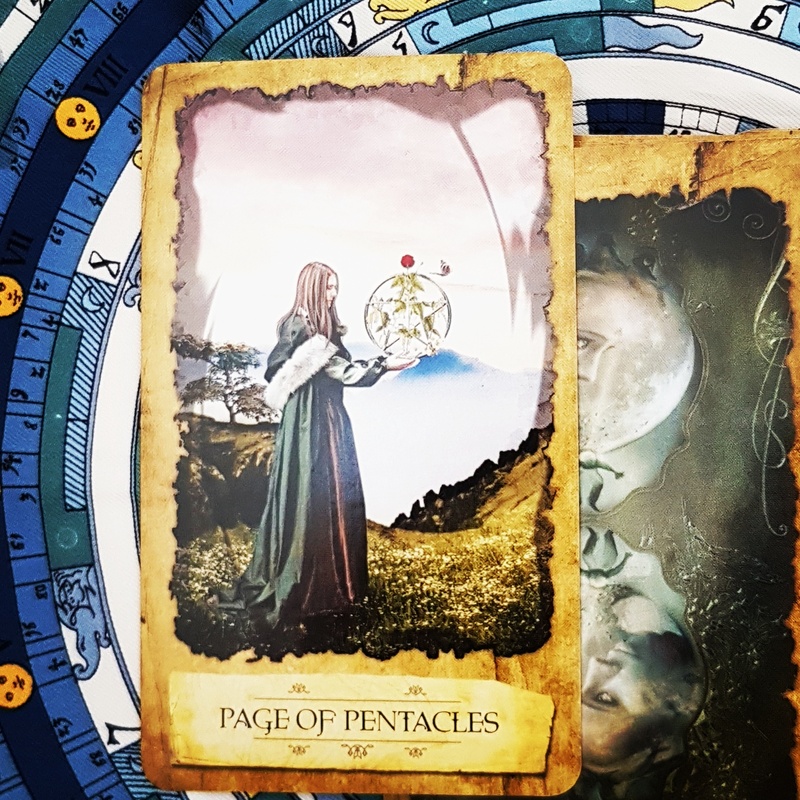 The Page of Pentacles is industrious, crafty and earnest about saving money. This Page likes to learn new things and enjoys structured learning, classes, workshops and programs – look out for events that interest you this week. You can be clever and creative in finding little ways to earn extra income. Look out for messages about money, resources, material matters and health issues. Say yes to any opportunities that come your way this week. 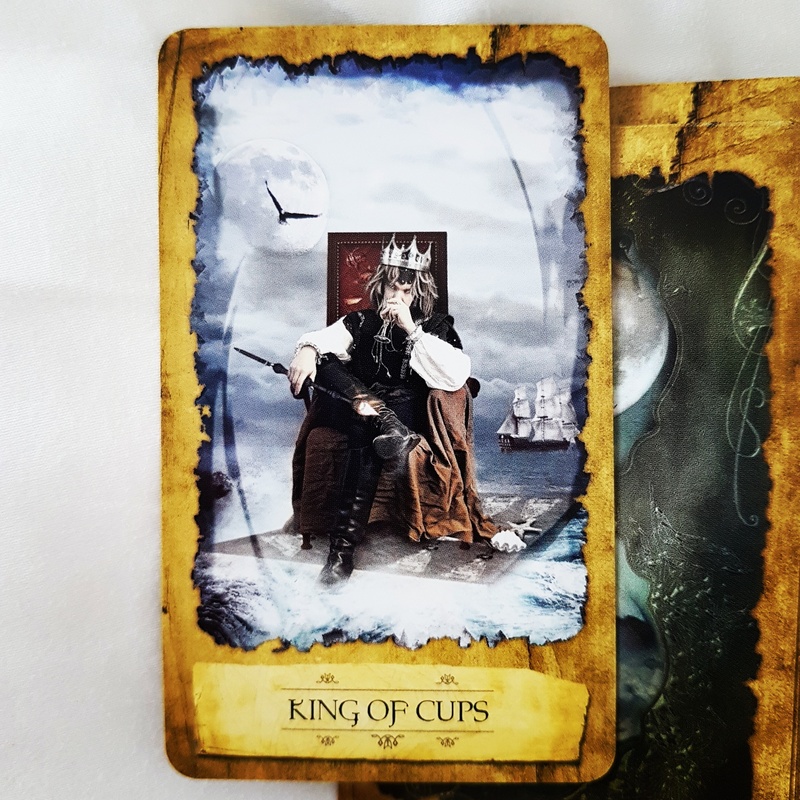 The King of Cups is peaceful, sensitive, affectionate and calm. He loves his home and values family and a relaxed home life. He enjoys expressing himself creatively but is even more supportive of others’ creativity, sometimes at the expense of his own. He is generally friendly and caring, a very nice man to have around. This week, take the kinds of actions he might take: respond calmly in a crisis; use diplomacy rather than force; reach out to help someone; accept a different point of view. 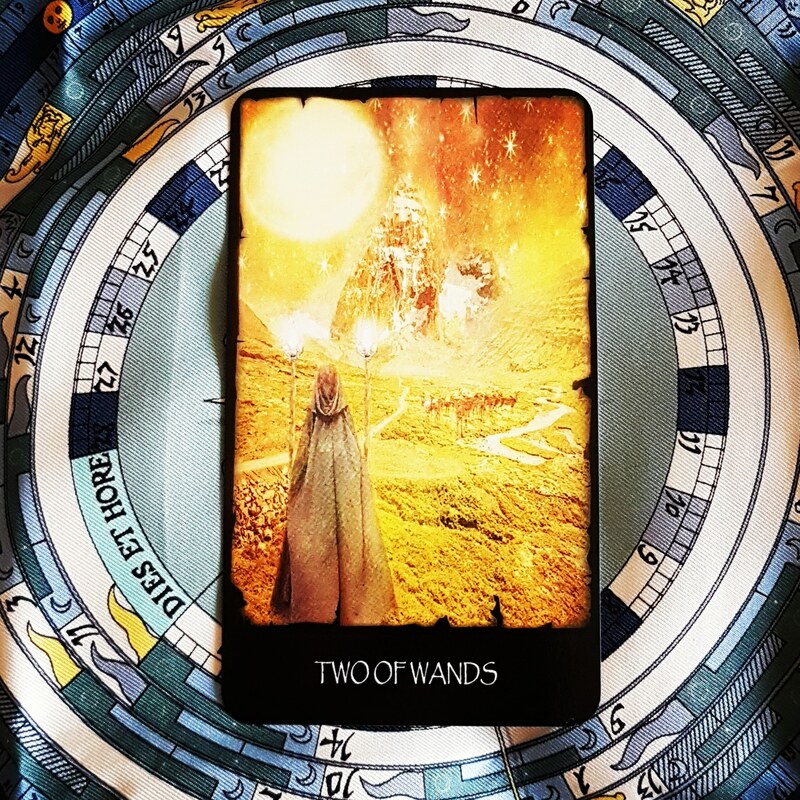 The 2 of Wands suggests the need to choose between two ventures. In this case, either option requires your full passion and attention. This is not the time to split your focus and your energy. Although both choices are appealing, go with your instincts and you will make the right choice. 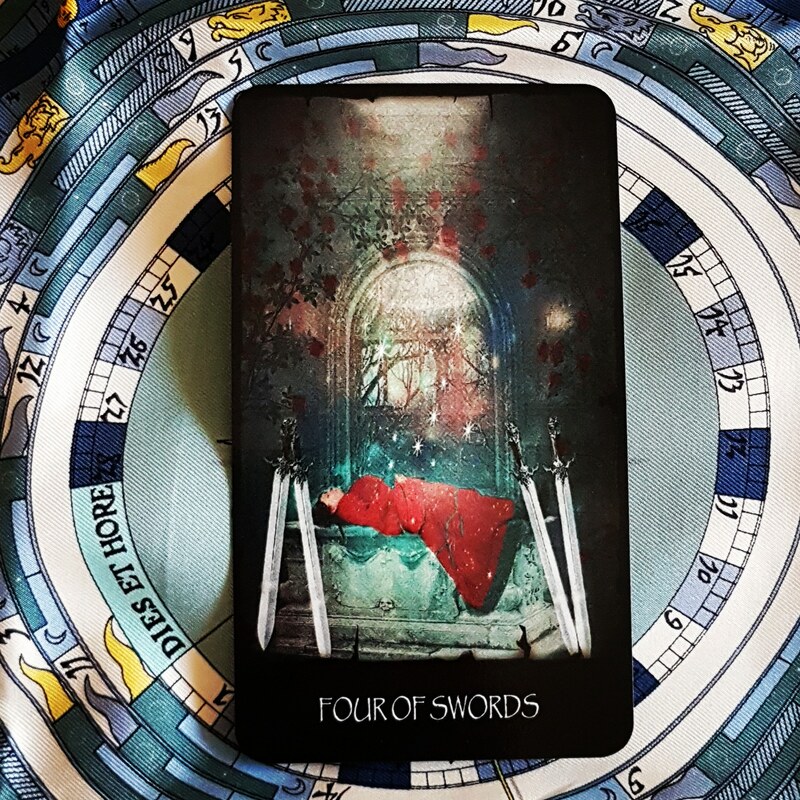 The 4 of Swords suggests that you have situations, troubles or problems that need resolution. However, this is not the time to deal with them head on. Rather, it is a time to take yourself away, calm down and heal a bit, so that you can approach your issues refreshed. Quiet, peaceful reflection and meditation will bring clear insight so that you can handle the situation to your benefit. Spend time alone and meditate to release the tension in your body. Do anything that lets you relax and just ‘be’. 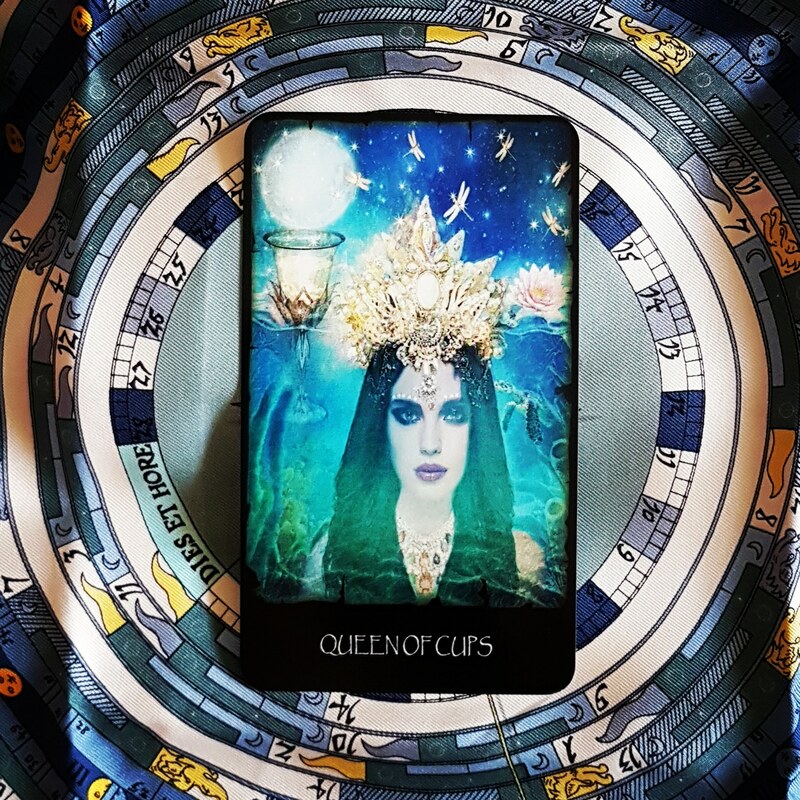 The Queen of Cups has a kind word for everyone and never reacts with anger or impatience. There is a gentleness about her that soothes and calms. Compassion is her watchword. Her reactions to the world are guided by her feelings. She lets her heart lead the way in all matters. Her love embraces everyone and everything. 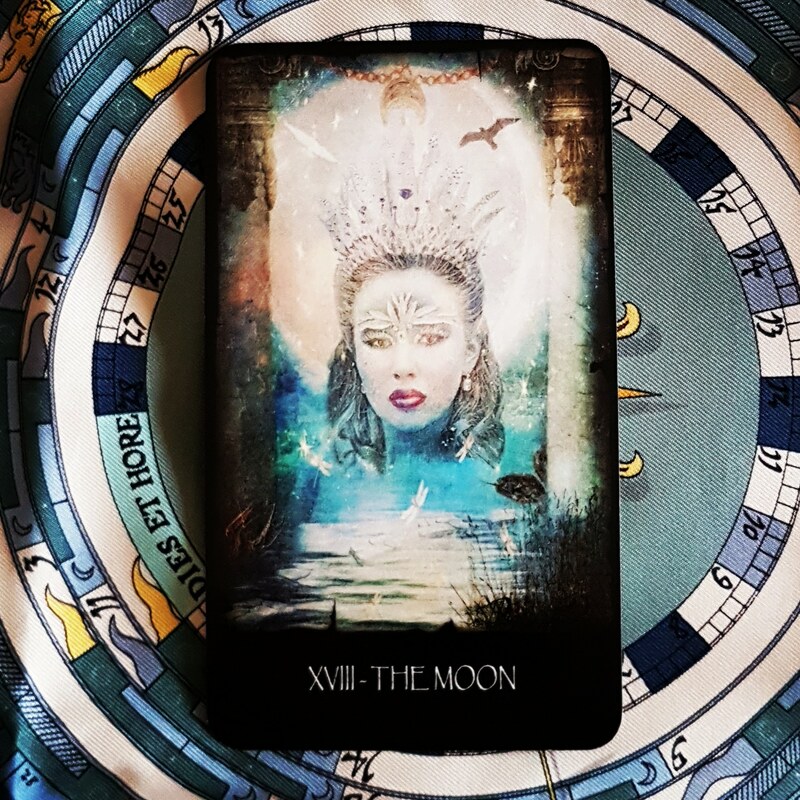 This week, try and think and feel as she does: Are you aware of the emotional climate? Are you feeling loving? Do you trust your heart? The Moon is at once dreadful and beautiful. It represents dreams, instincts, intuition and fears. Its gentle light provides both illumination and shadows. This light can cause things to seem either safer or more dangerous than they actually are. Be prepared to be both frightened and inspired. Carefully separate your intuition from your fears and follow your intuition. Pay careful attention to your dreams at this time as they may hold important messages. Great inspiration is at hand, but it won’t be an easy journey. 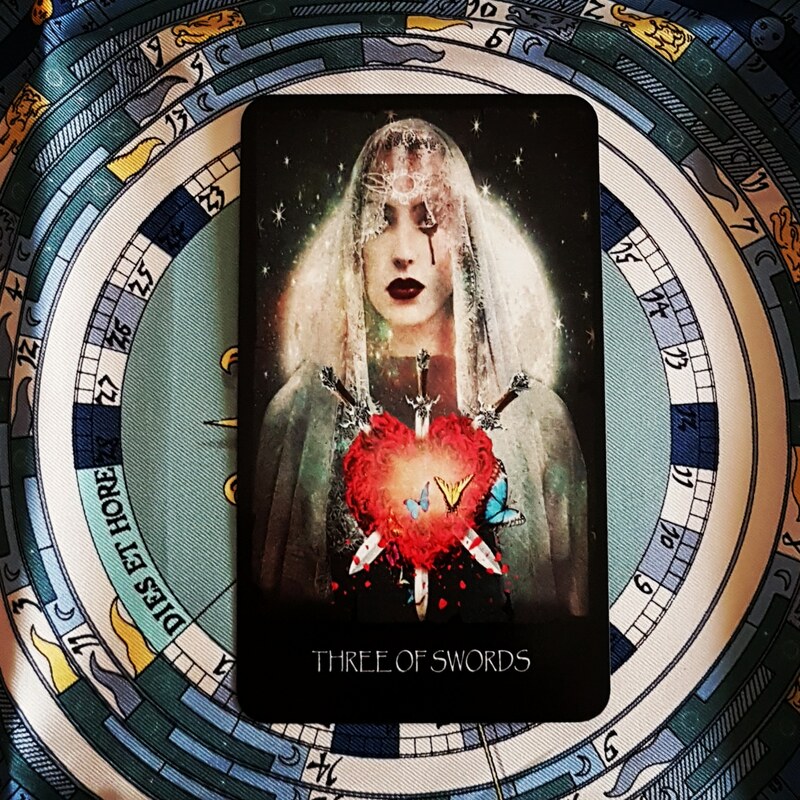 The 3 of Swords is one of those dreaded cards in a tarot deck, signifying heartache and disappointment. Life sometimes brings us these moments and this card signifies that. It represents a new, raw pain. It can be a major situation, such as finding your lover unfaithful, or a smaller one, such as cutting and hurtful words from a trusted friend. Swords represent truth and this is a case of the truth hurting very much. The 10 of Coins represents a strong, secure foundation, usually based on family ties, whether a home or business. It also deals with legacies, received and given. You may either receive a legacy or small winnings to invest for the future. Or you may acquire a home or business of your own, creating security for you and your loved ones. Another possibility is investing in the community in some way, through a scholarship fund or civic improvement. This could play out several ways, but however it does, it’ll be good, prosperous and beneficial to you and your loved ones. 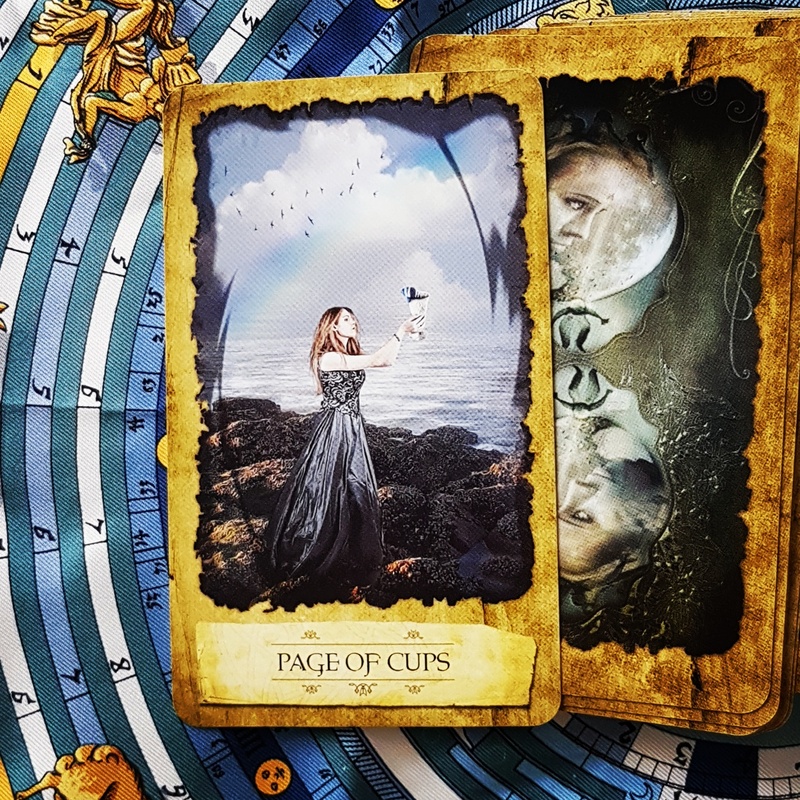 The 5 of Coins indicates going through rough times, either physically or financially. That is hard enough, but this card carries a more distressing message. You are letting these hard times erode your spirit, your faith and your desire. You don’t have the energy to get through this time. You have no faith that things will turn around. You don’t even desire to seek the help that may be available. Your pride may be stopping you from asking for help as you may not want to discuss your situation with others. If you’ve been giving too much of yourself to others, it’s time to stop and care for yourself. The Tower indicates a major change in your life or belief system. Be prepared for emotional upheaval and distressing events. 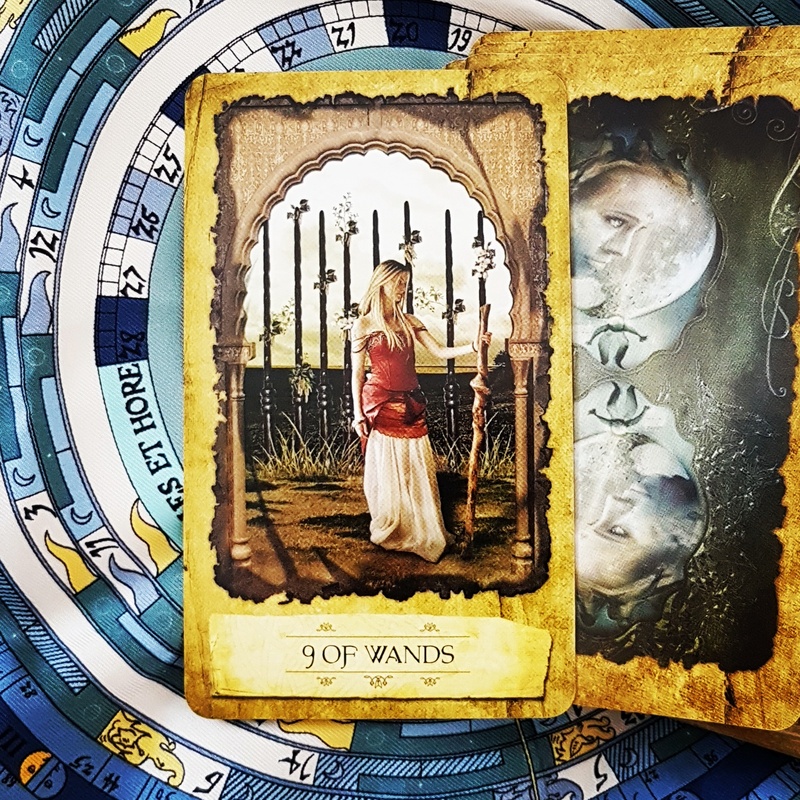 This bolt from the blue, this event will create a spiritual epiphany that will allow you to eliminate all that is no longer useful or good for you. Lies and half-truths will be revealed. It is a sort of purification. Whatever is solid and good will remain. You will have a foundation that has survived trial by fire and you can rebuild with confidence, once the dust has settled. If you feel that your life is falling apart, notice what false beliefs are being destroyed in the process. 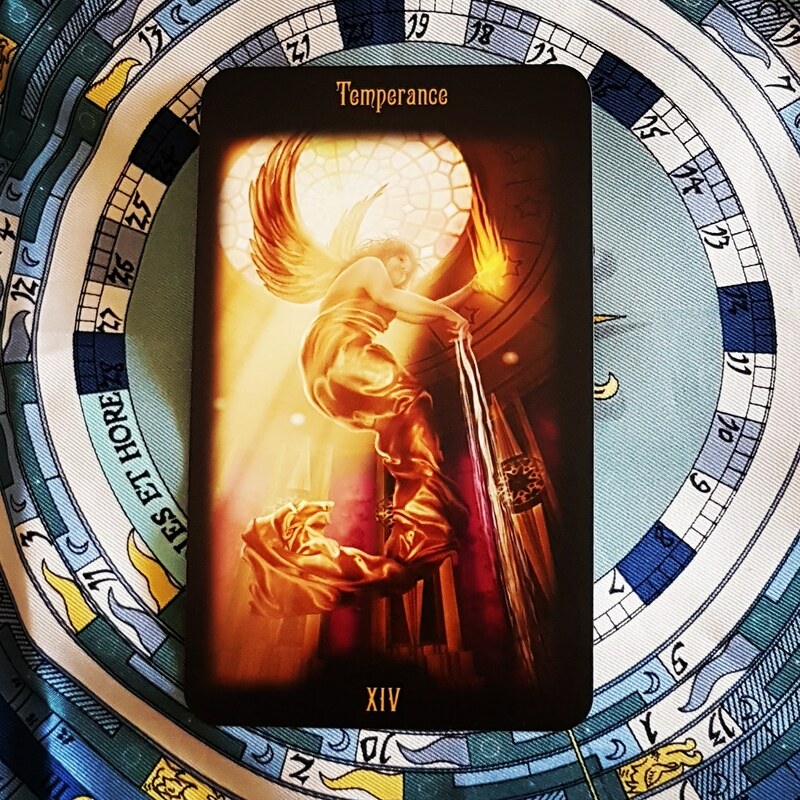 Temperance – This card suggests that you watch your balance. Take the time to make sure that your reactions, decisions and words are appropriate for the situation at hand. You are advised to practise moderation and patience. This is no time for extreme behaviour or melodramatic gestures. Judgement provides a call. You are being called to face your past before moving on. It is time to acknowledge whatever has happened, accept it, and let it go. You have learned so much and been through so much, you now have the wisdom and strength to free yourself from the past. A time for change is at hand – perhaps a new job, a new relationship or a new way of life. You’re in control and have decided to heed the call. You have the experience and knowledge to move forward. You just have to make your final farewells. 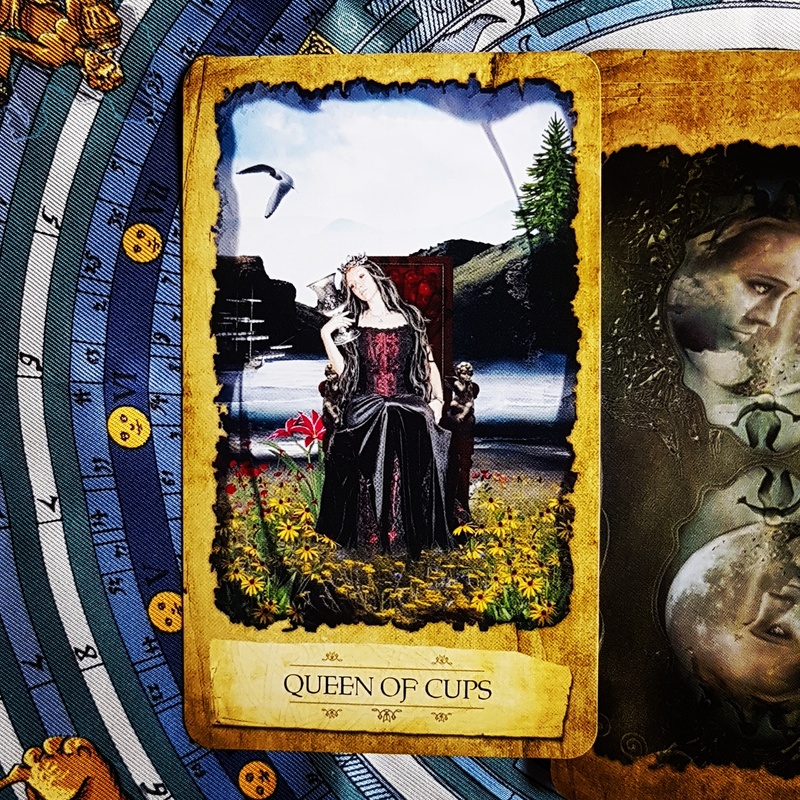 The 8 of Coins is known as the ‘apprentice card’. It means you’ve taken up a new job, craft, art or activity. It’s not an easy road, for being a beginner brings a hard learning curve and tedious repetition until you get it perfect. Because you have a goal and the passion that comes with a new endeavour, it’s likely the bumpy, beginning part of the journey will not discourage you. 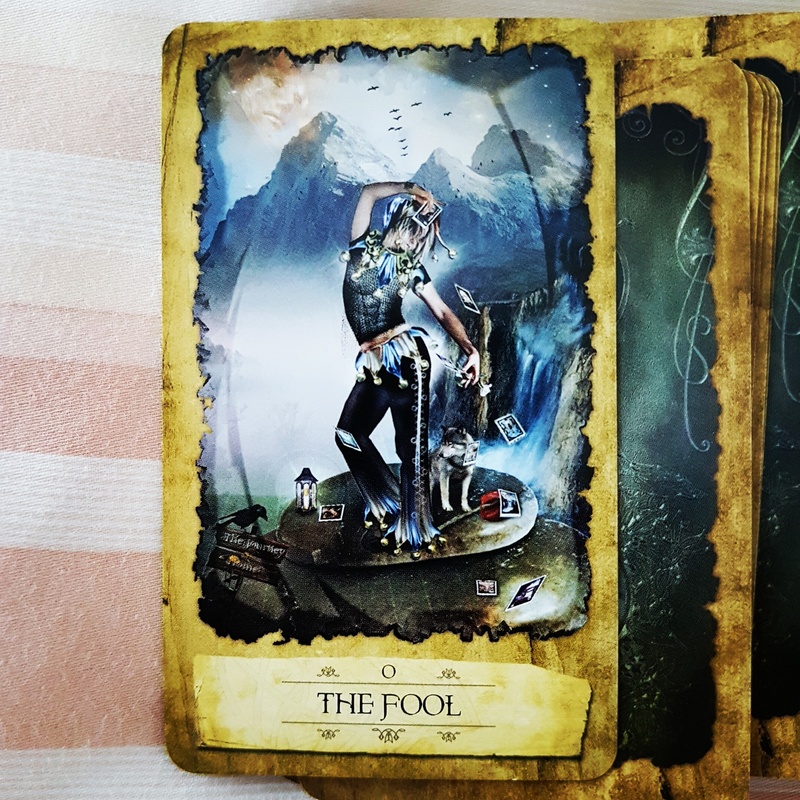 The Fool indicates being at a crossroads. 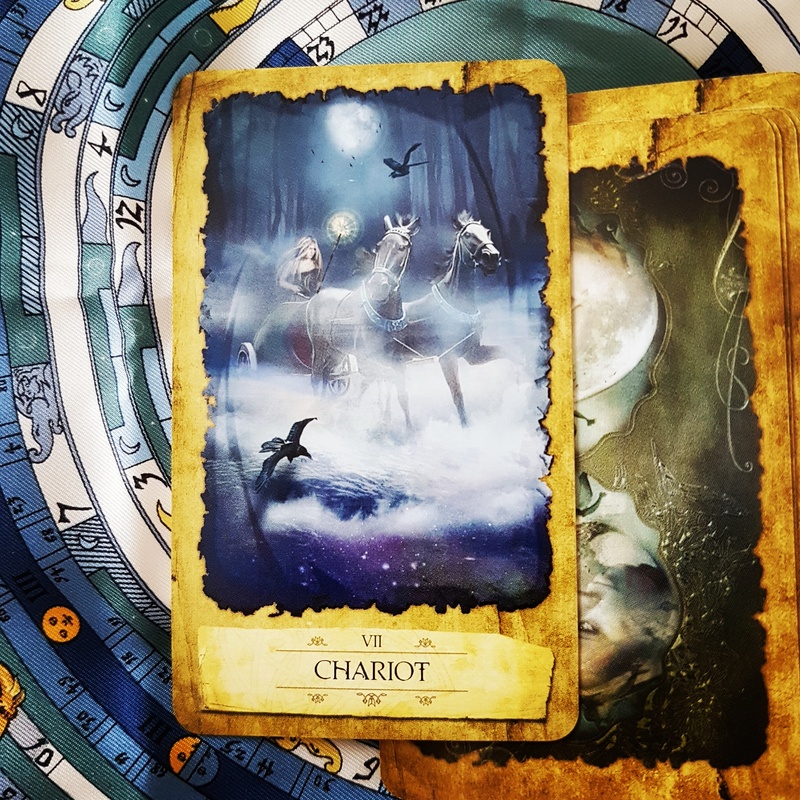 There are a variety of paths you can choose and this card suggests making an intuitive decision, even if it seems illogical. This is a moment for faith and trust, in yourself and in The Universe. Follow your heart and embrace whatever comes your way. If you could start anything knowing it would be successful, what would you do? Start something new this week. The Page of Coins is industrious, crafty and earnest about saving money. This Page likes to learn new things and enjoys structured learning, classes, workshops and programs – look out for events that interest you this week. You can be clever and creative in finding little ways to earn extra income. Look out for messages about money, resources, material matters and health issues. Say yes to any opportunities that come your way this week. 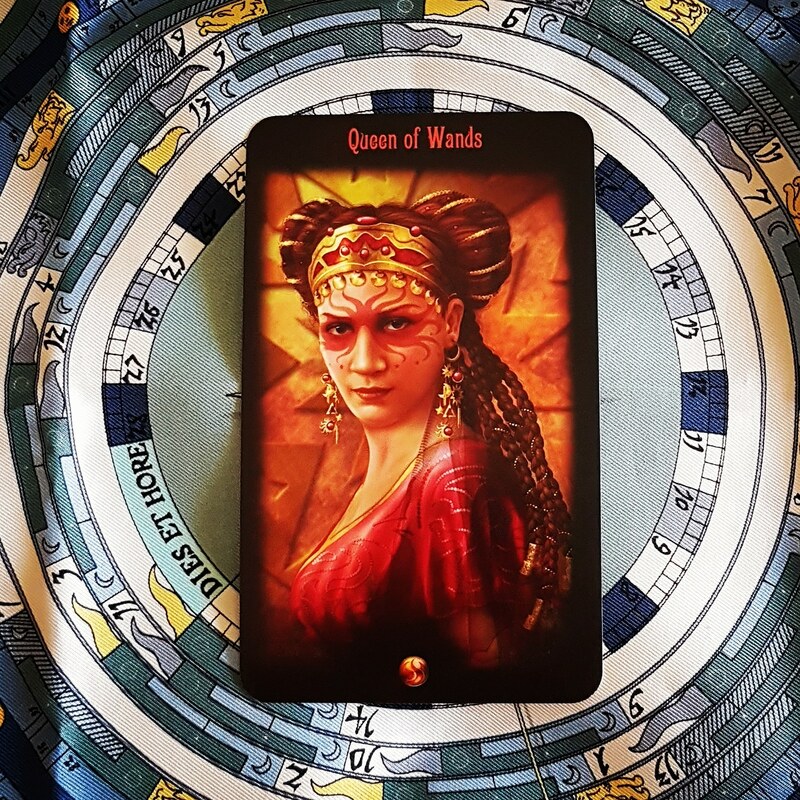 The Queen of Wands is always attractive, often good-looking and has many admirers. Her energy is contagious. She tackles every task with dedication and commitment. She is always upbeat and cheerful – ready to look for the positive in the situation. Her life is full and busy, and she prefers it that way. She keeps up this pace because she is radiantly healthy and fit. She is often a good athlete, being naturally strong and coordinated. 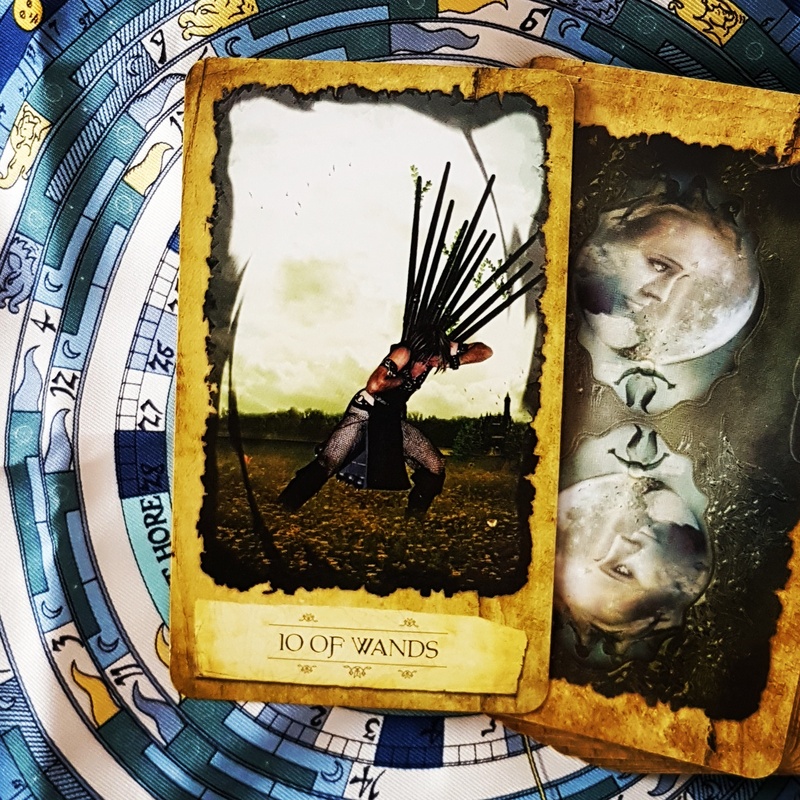 Although she’s never arrogant, the Queen of Wands has a deep faith in her own abilities. Her quiet self-assurance comes from the knowledge that she can accomplish whatever she sets her mind to. This card asks you to think and feel as she does. For example: Do you feel attractive? Do you believe in yourself? Are you full of energy? Can you shake off the blues? Are you gung ho about life? 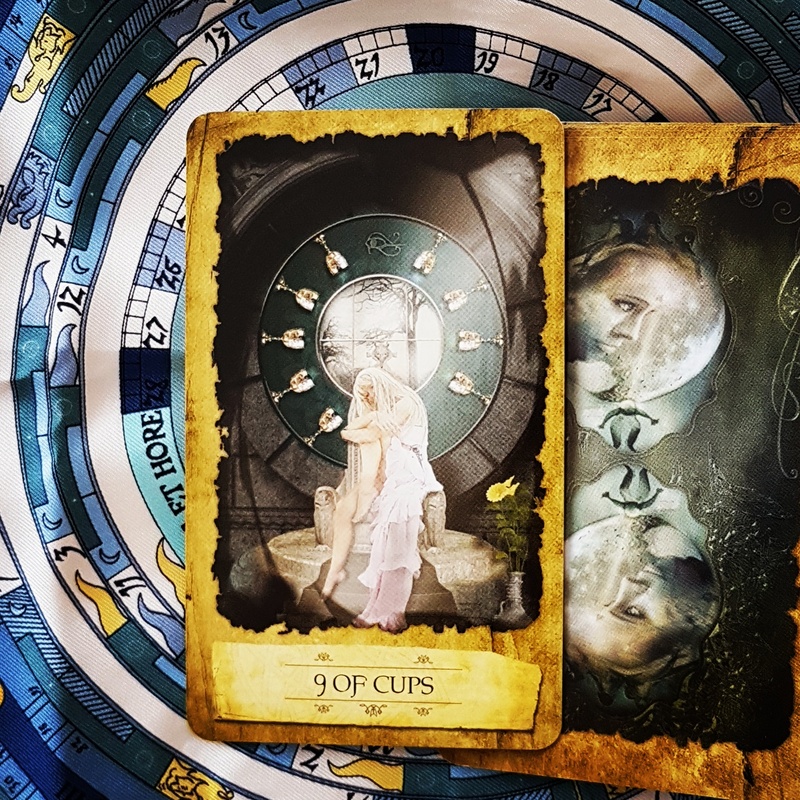 The 10 of Cups rarely needs any explanation – the image is one of ideal family life. For you, this card can mean just that. Or it can represent the components of such a life: a safe, comfortable place to live and people, either friends or family, to share your life. It’s about having people to share your joys and support you through your sorrows. 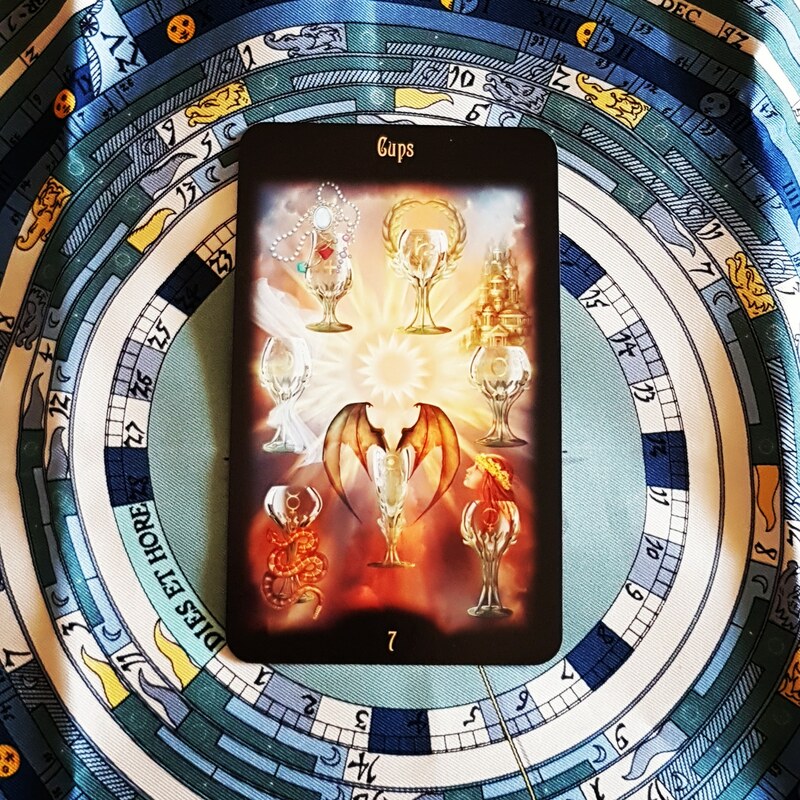 When you see the 10 of Cups, know that an end to hostility is possible. If there is fighting around you, it may cease. If you are at war with yourself, you may find peace. This card often signals a time of abundant blessings. It tells you that you can reach for the fulfilment you deserve and it will come to you. Look for ways to realise joy and create peace. You may find the key to happiness in your family. Your family is the group of people you are attached to emotionally – for better or worse! If there is trouble in your family right now, work to restore harmony. The time is right for greater closeness. Look at all those Cups! Have a great week! 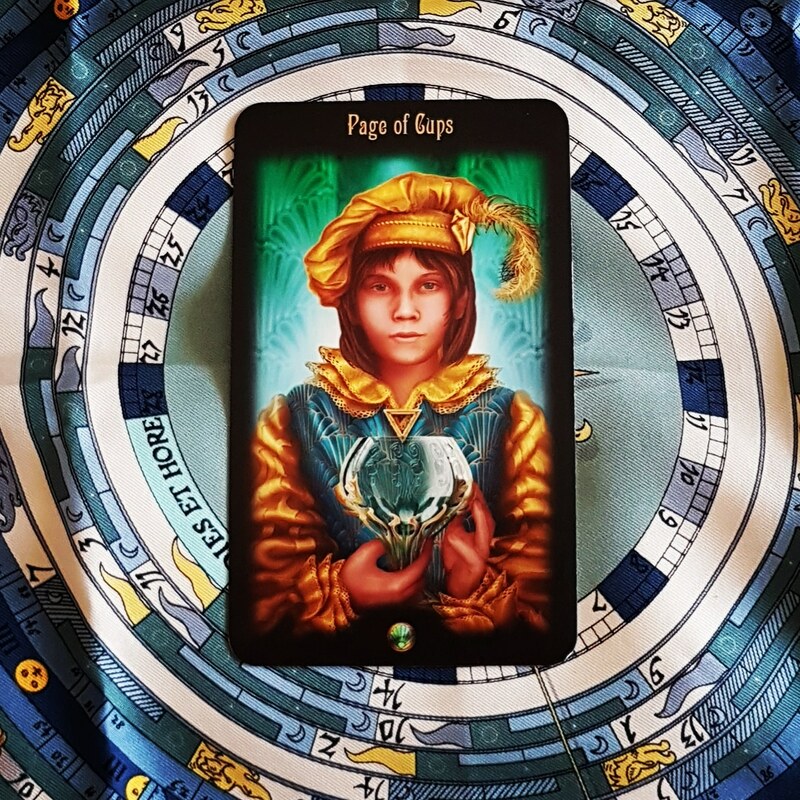 The Page of Cups is Cupid bringing you opportunities for love. He delivers real chances to experience romance, deep feelings and the inner life. 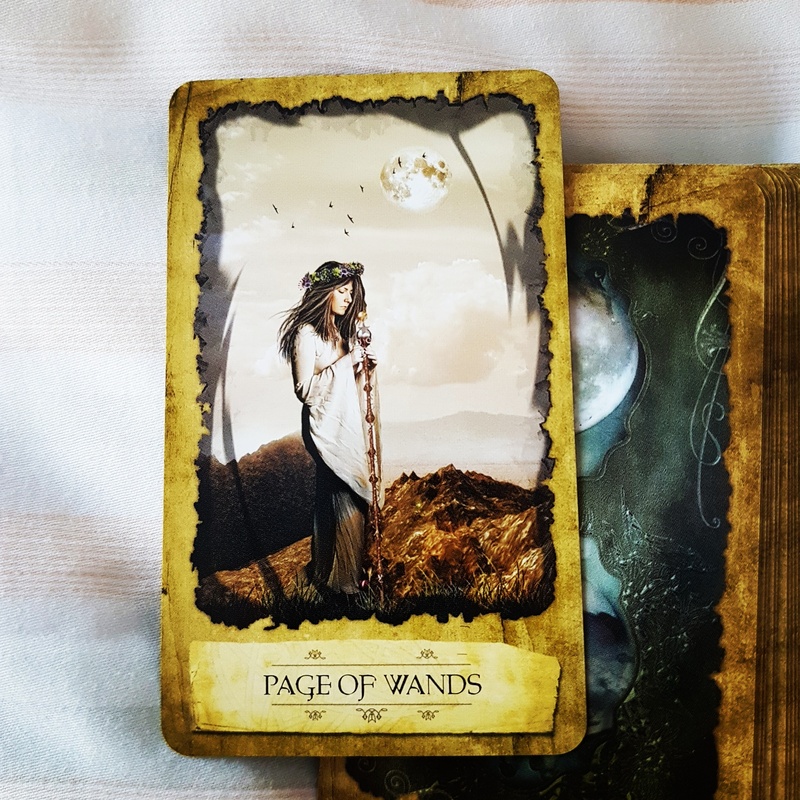 In readings, this Page suggest that an opening may appear that stirs your emotions, pulls at your heartstrings or brings you great joy. When you see such a chance, act on it! Take some time out to do something creative, maybe read a book about poetry, sign up for an art class or spend some time with a child and let out your own inner child. Have fun! 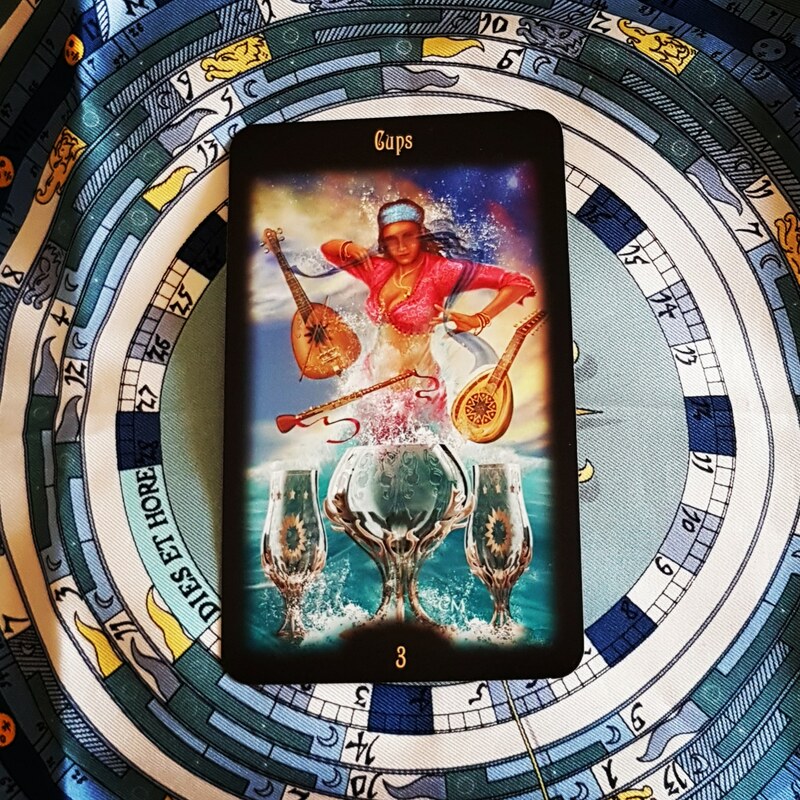 The Ace of Cups represents a gift of love. This can take the form of a new romantic interest, a creative desire or a spiritual awakening. At this time, your life is filled with possibilities and abundant, joyful emotions. All you need to do is embrace the moment and use that energy for the start of something wonderful. 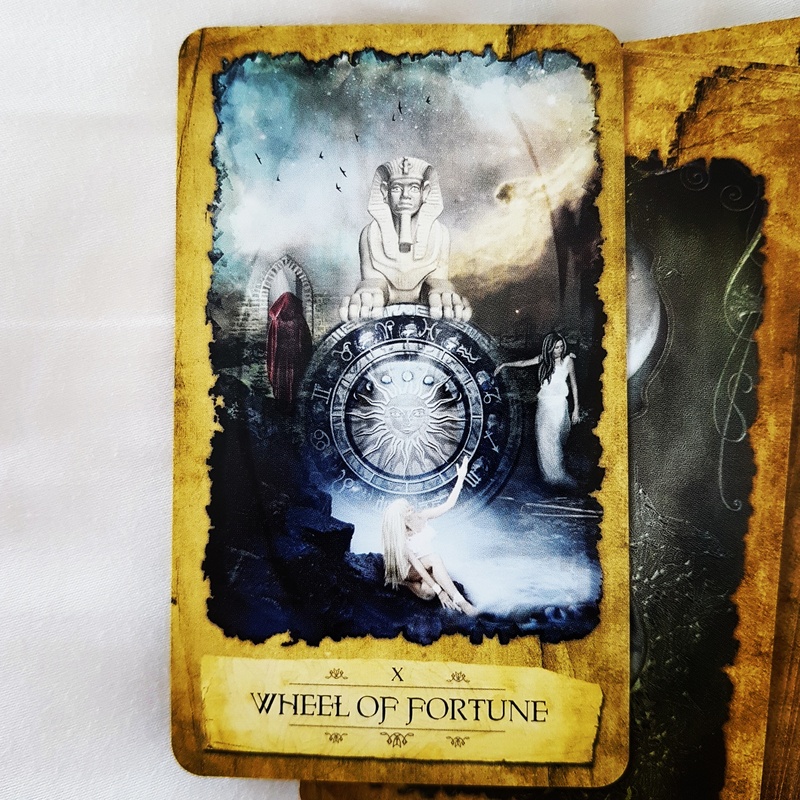 The Wheel of Fortune represents an unexpected change in your plans, a conflict of interest or an idea ready to materialise. Whatever happens will be beyond your control. This card advises you to get ready for something new. Don’t be rigid with your plans at this time, but prepare to go with the flow. Take any events that occur in your stride, whether they are positive or negative. If things are good, enjoy! If things aren’t so good, know that it will not be forever. 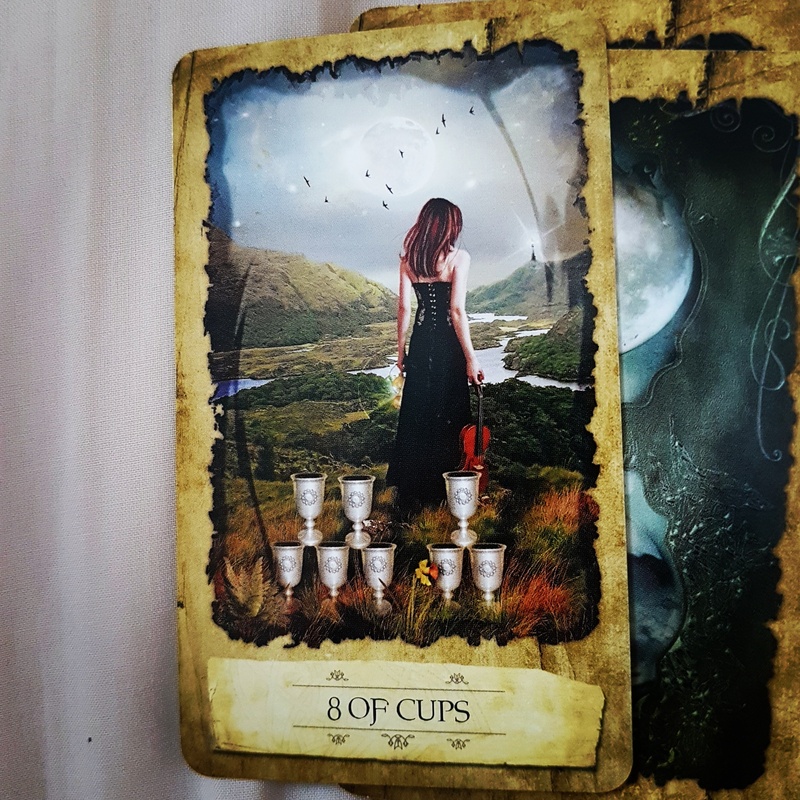 The 8 of Cups represents a very small but powerful moment in time. You’ve decided to leave something comfortable behind and you’ve come to terms with that. You’ve decided what dream you’re moving towards. 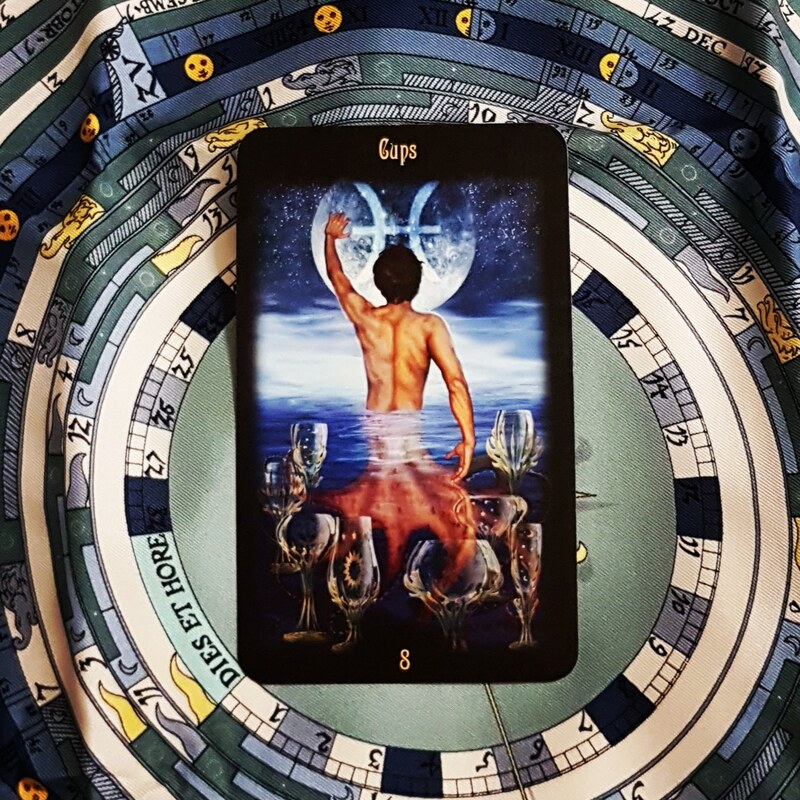 This moment, the one where you finally turn your back forever and before you take the first step, is the 8 of Cups. It can be such a conflicted moment, filled with sadness over leaving, yet knowing you are doing the right thing. You no longer need to be linked to this difficult person or situation – but walking away requires great strength and courage. Are there any relationships or values draining your energy from which you need to walk away? 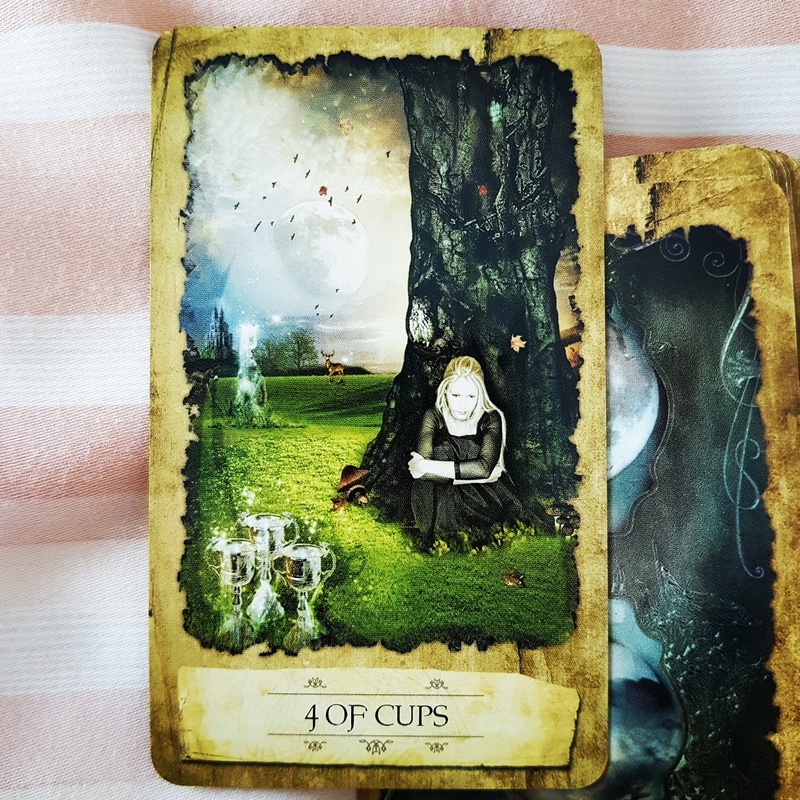 The 4 of Cups represents self-aborption, apathy and boredom. You have been disappointed by somebody or something and now you’re emotionally stuck. You don’t like what’s in front of you and you can’t be bothered to look further than your own brooding mind. It is a shame because if you listen to the voice of wisdom, you will look up and see what you need is not far away. 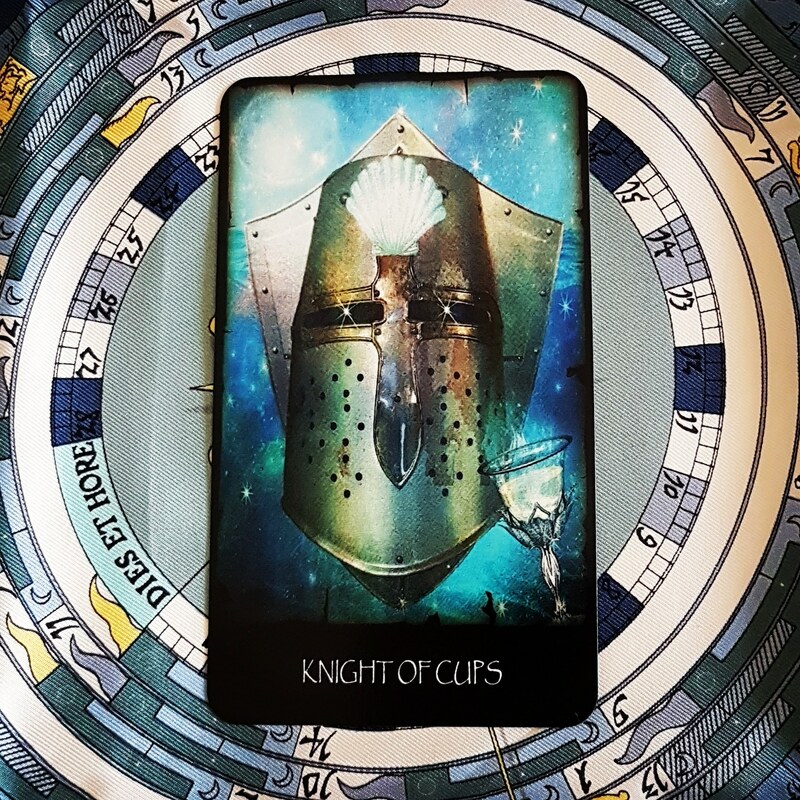 The Knight of Cups’ sensitive style is involved in a situation as an aspect of you, someone else or the atmosphere in general. Follow your heart and see where it takes you. Instead of dreaming, get up and do what your heart desires. Do you express yourself fully to people around you, even the ones that you are close to? If not, what holds you back? Tell someone how you really feel this week. The Knight of Coins is like a bulldog – once he bites down, he won’t let go. He’s dogged in pursuit of his goals. He’s a hard worker, has tremendous stamina and is dedicated. Every job is completed down to the last detail. On the other hand, this Knight can be stodgy and dull. He’s not known for his playful sense of humour. Work always comes first and he can be inflexible and obsessive about little details. He refuses to give in, even when he’s wrong (which he’ll never admit). 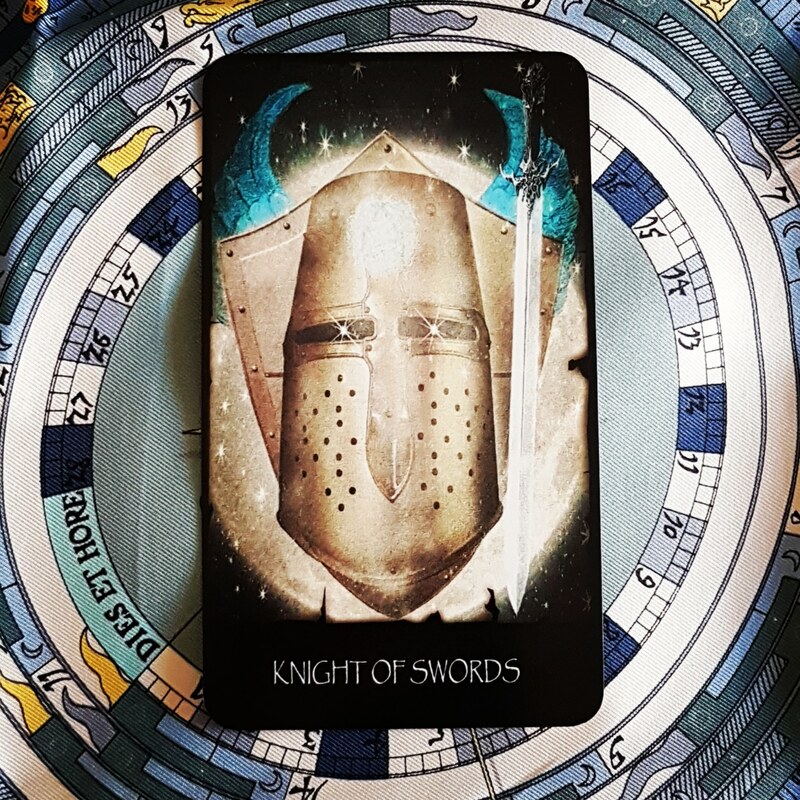 This week, ask yourself whether this Knight’s energy is helping or hurting you – try to find a happy medium between his two extremes. 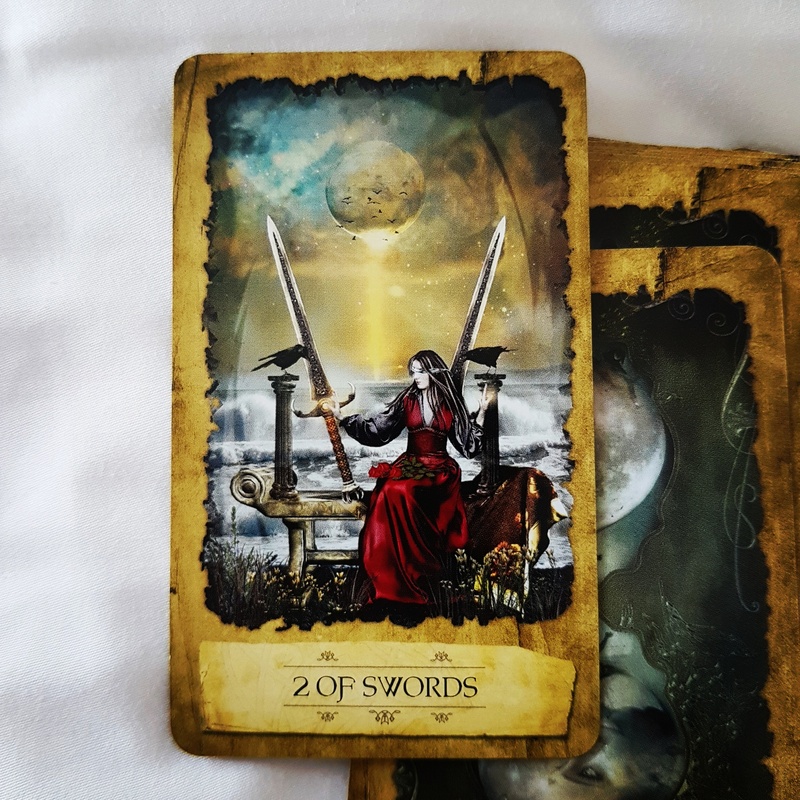 You can always count on the Queen of Swords to tell you exactly how it is. Above all else she admires honesty, and she lives by her commitment to being truthful. She is experienced in the ways of the world, good and bad. She prefers being straightforward and direct. Her observations are candid, but never hurtful. In fact, this Queen has a delightful sense of humour. She likes a good laugh and always has a witty comeback ready. This week, think and feel as this Queen does. For example: Are you being completely honest? Do you see the humour in the situation? Are you getting right to the point? Have you figured out what’s really going on? Say no to the things you really don’t want to do but usually end up doing to please others. 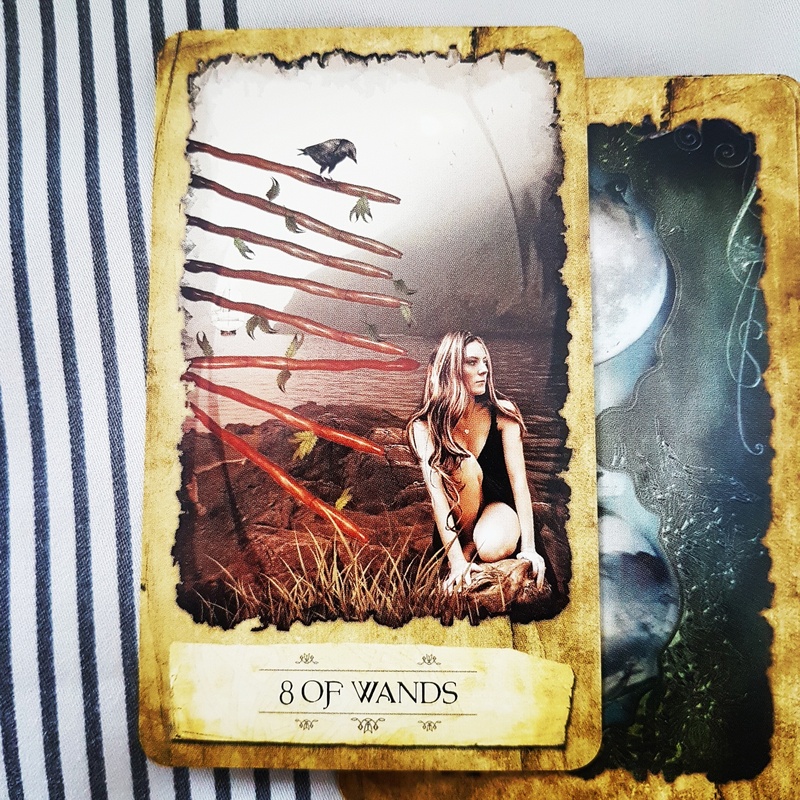 The 8 of Wands is full of fast-moving potential. You need to be ready to spring into action! Whether you’ve set up things ready for action or you’ve been watching for your opportunity, the moment has come. Things may seem chaotic, but just jump in, maintain your focus, trust your instincts and you should do well. If there’s something you’ve been putting off, this is the time to do it. Stop making excuses and just do it! This card can sometimes indicate getting news or information you’ve been waiting for or quick, unexpected trips. 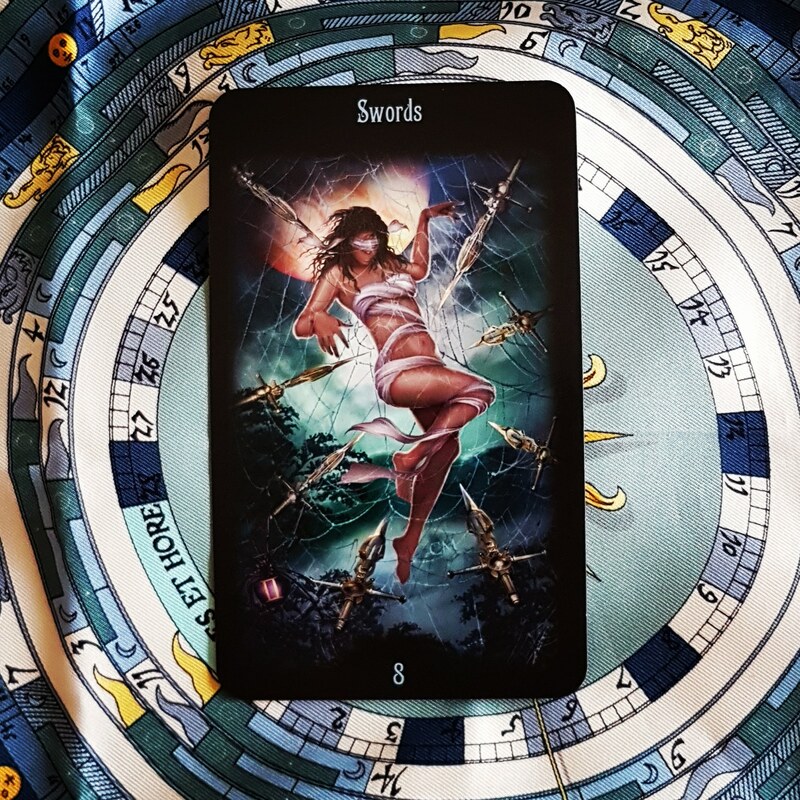 The 2 of Swords represents a difficult situation. 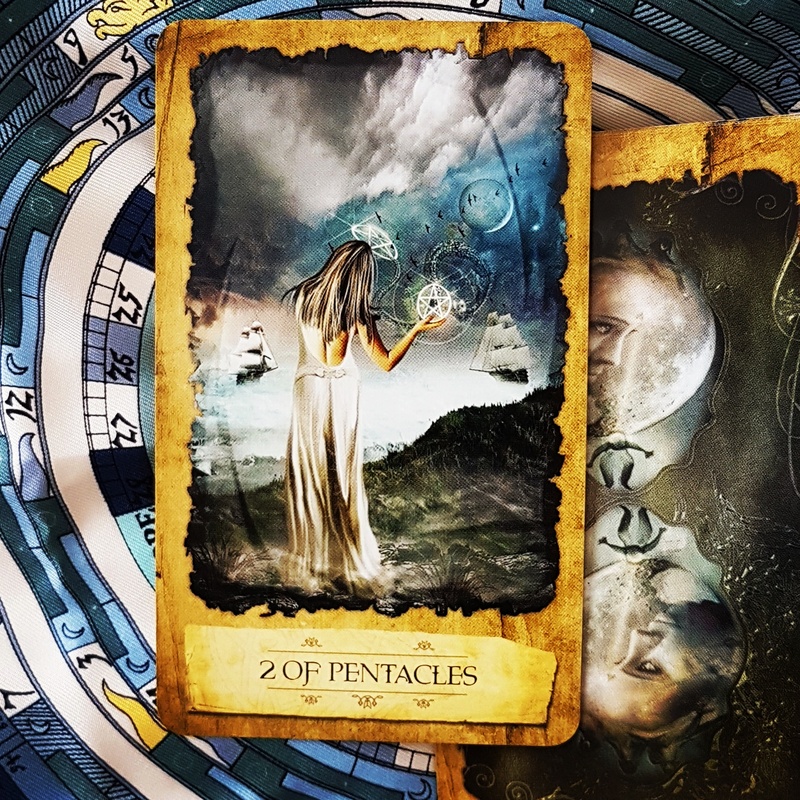 You are dealing with two conflicting ideas or a challenging decision, but you are not willing to face the situation. You’ve closed your eyes to it. Rather than view it rationally, your emotions are distracting you. This situation would benefit more from a rational decision than from an emotional one. This card can also represent a truce or stalemate. What decision are you not wanting to make? Why? Be decisive. 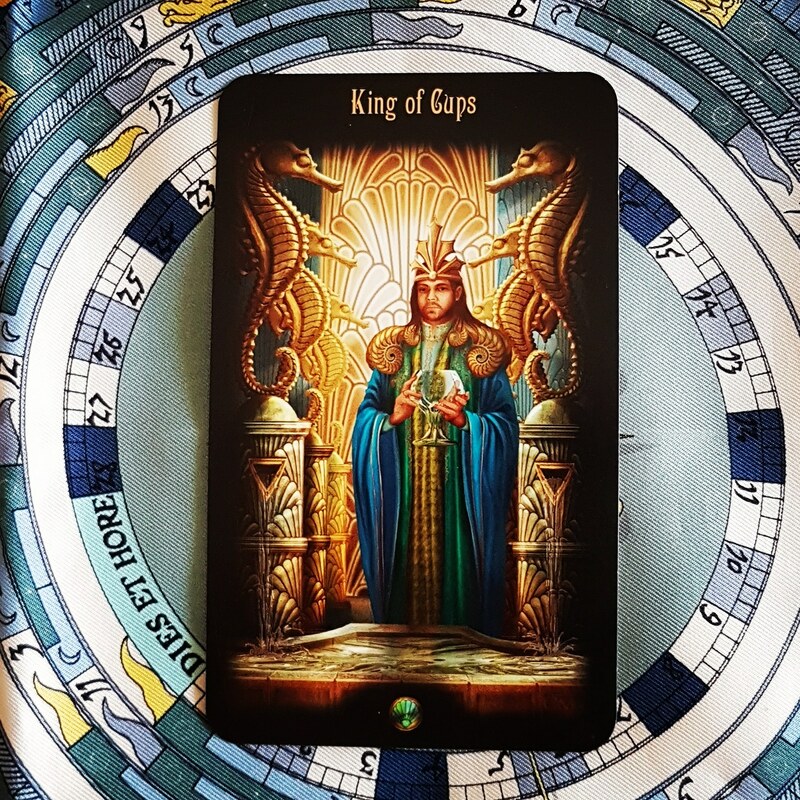 The King of Pentacles indicates that, for some of you, your hard work has paid off and you are financially secure. You may need to play the role of provider to someone, either personally or professionally. It may be that a project comes up which requires you to use facts and figures instead of your creative side. For others, if you are having financial issues, draw up a realistic plan of action on how to make use of your resources. Set your priorities straight. If you haven’t already done so, look into making your will. 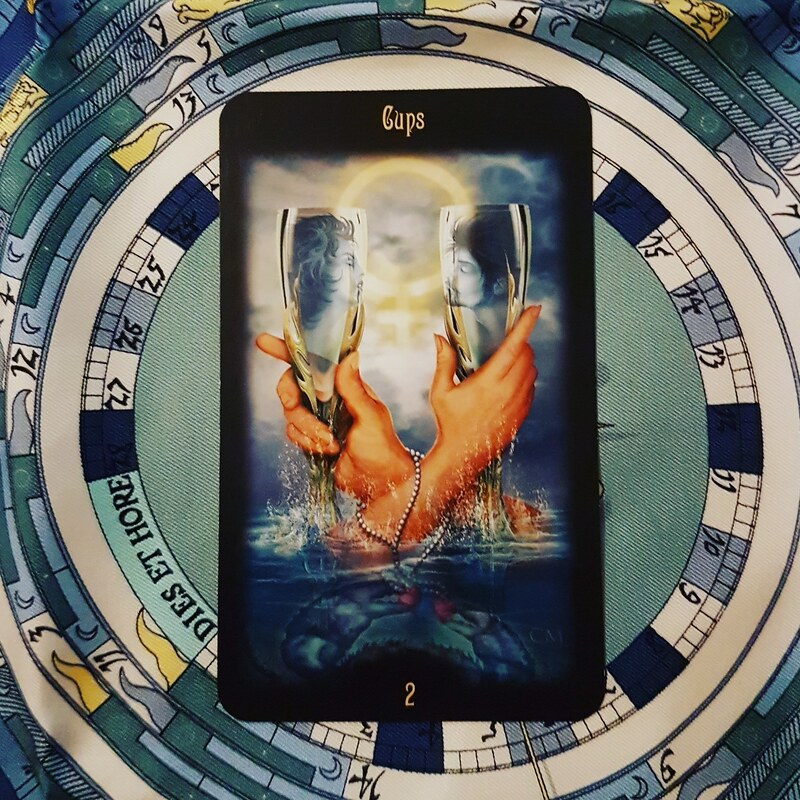 The 2 of Cups promises a strong and passionate relationship. Such a relationship brings beauty and power to life. While this can be a romantic relationship, it can also mean any such union of people, groups, ideas or talent. The key here is the coming together of two things that creates a third thing that is, in and of itself, powerful, beautiful and passionate. Let your most important relationships know how much they mean to you. Strength is about understanding your drives and passions. By understanding and accepting them, you can use them to achieve your goals. You can become so self-possessed that you move through your life with a quiet strength that doesn’t need to exert itself needlessly, but it is always ready when needed. 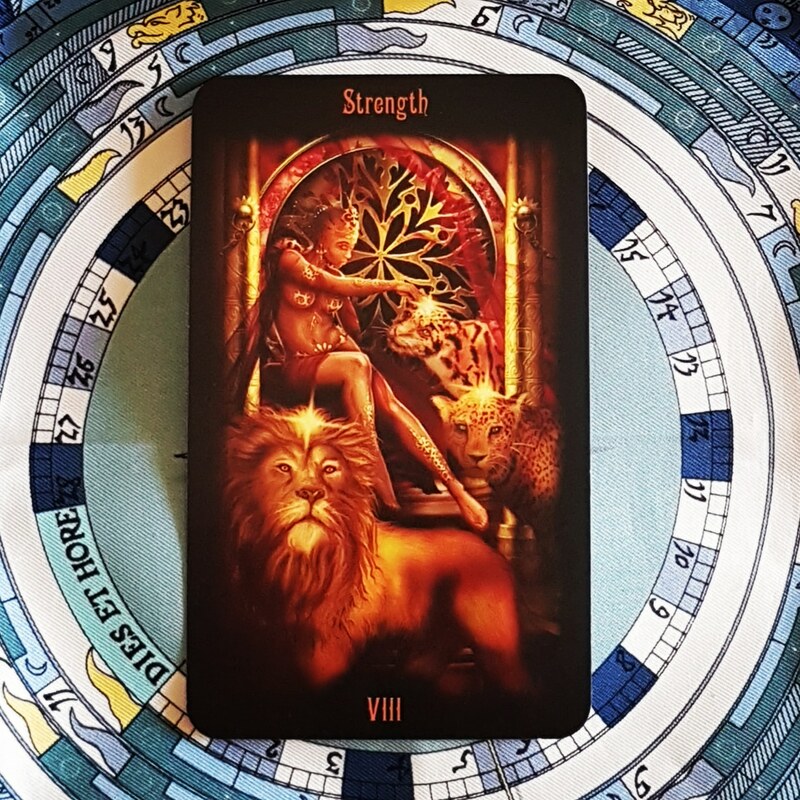 This card suggests that now is a time to exert that quiet, yet undeniable, strength. Do you know where you want to go in life? This week, do something that scares you. 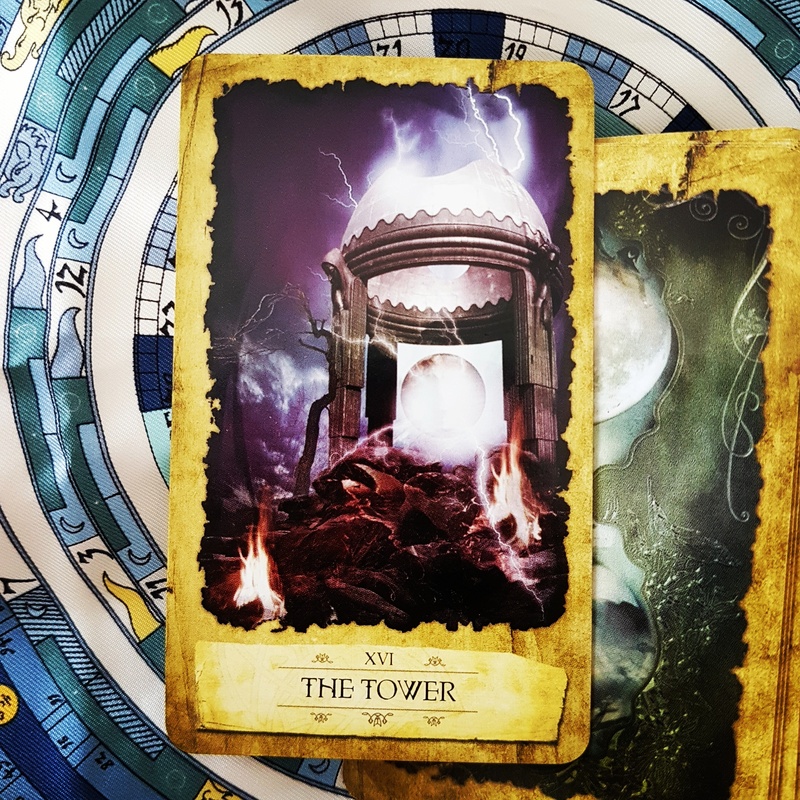 The Tower – The Tower indicates a major change in your life or belief system. Be prepared for emotional upheaval and distressing events. 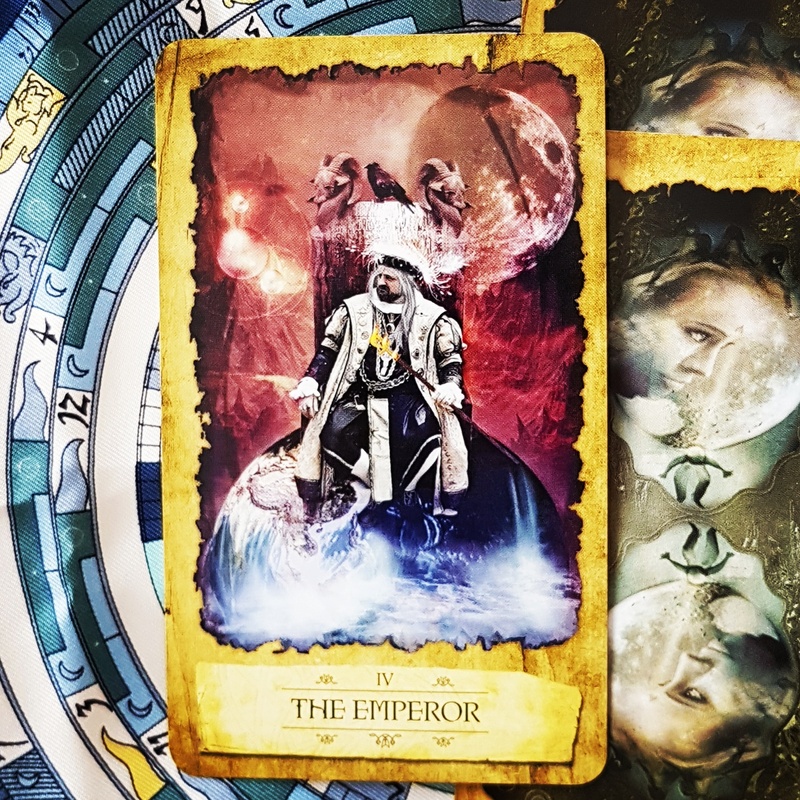 This bolt from the blue, this event will create a spiritual epiphany that will allow you to eliminate all that is no longer useful or good for you. Lies and half-truths will be revealed. It is a sort of purification. Whatever is solid and good will remain. You will have a foundation that has survived trial by fire and you can rebuild with confidence, once the dust has settled. If you feel that your life is falling apart, notice what false beliefs are being destroyed in the process. 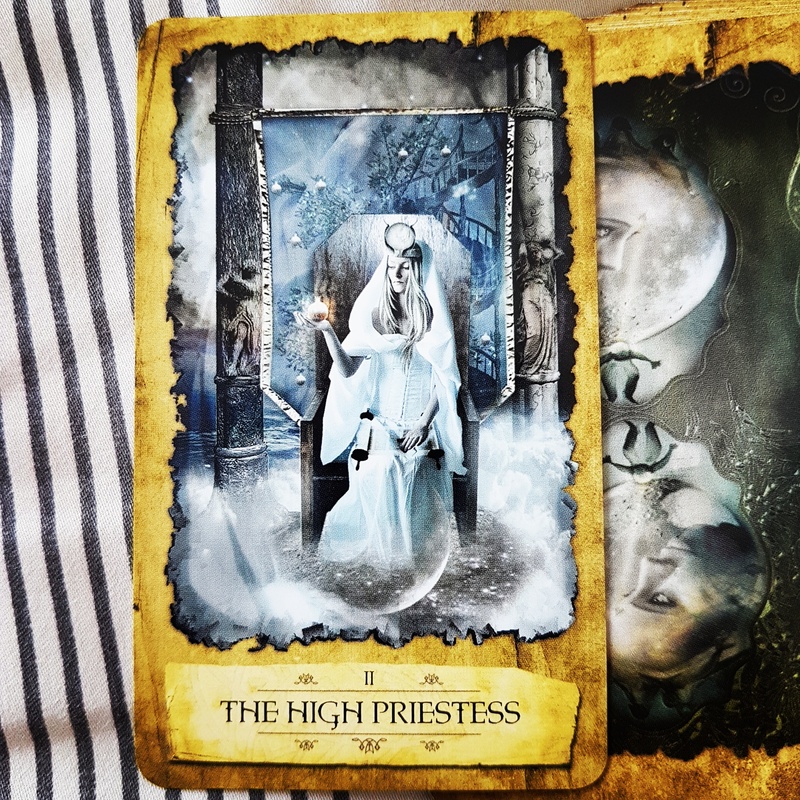 The High Priestess is about knowledge that you need and that can be revealed. This knowledge is beyond logic. You must access and trust your intuition if you hope to understand it – relaxation and meditation are the ways to do this. Refrain from action for a while and instead take the time to search within yourself for the wisdom you need to move on. It could also mark the beginning of a spiritual journey. On a mundane level, it suggests sharing knowledge and not keeping secrets. This week, pay attention to the world around you. Look out for any signs or synchronicities and what they are telling you. For your monthly readings, click here. For your weekly readings, click here. For a daily card, follow me on Instagram (@nectar1269). 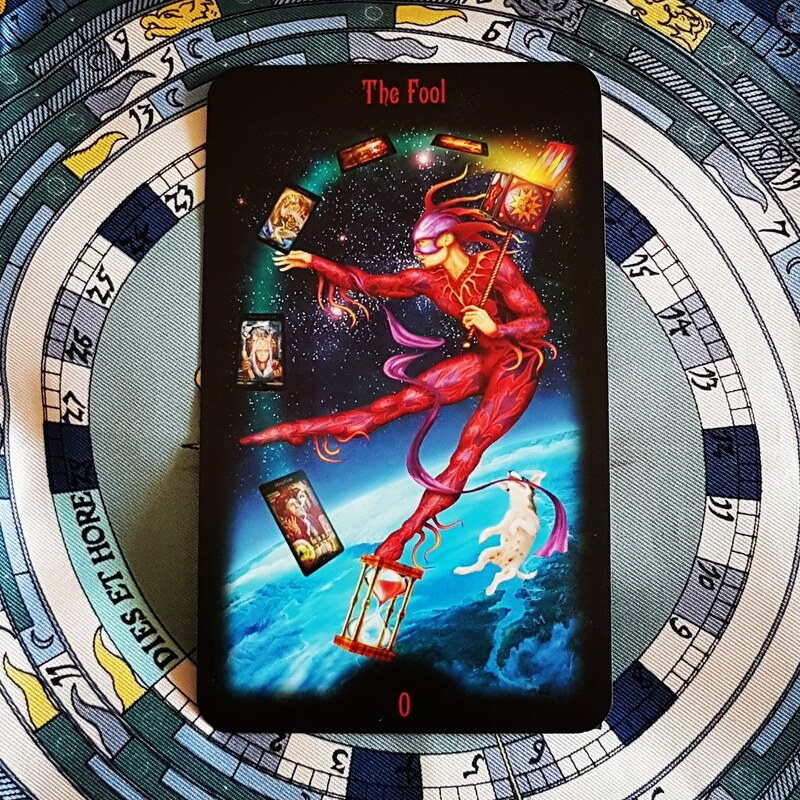 For a personal tarot reading, please contact me.